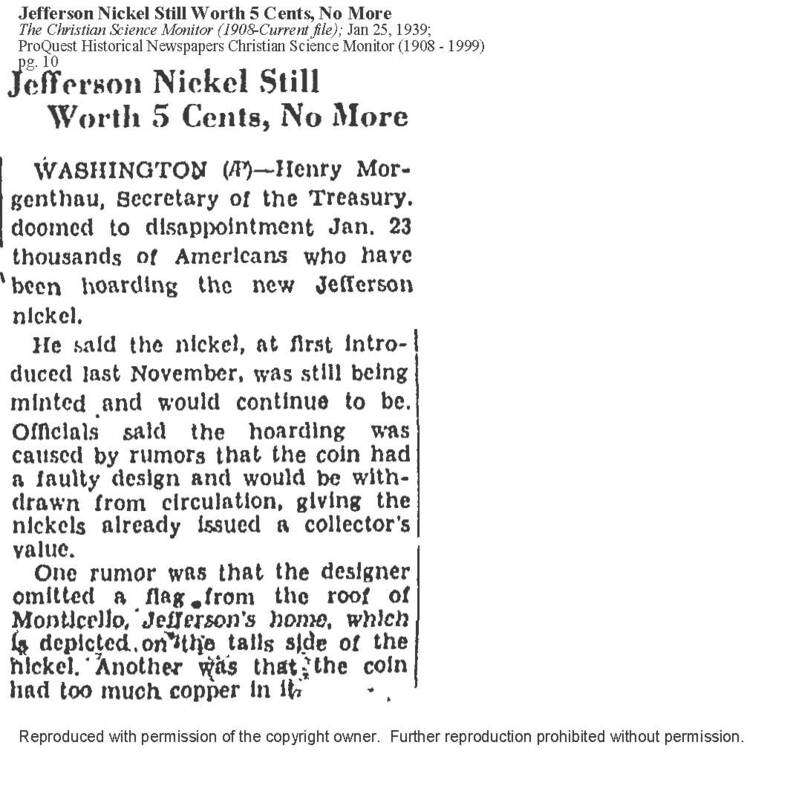 January 2015: A trip to the National Archives, College Park, Maryland yielded more than 470 pages of material pertaining to the Jefferson nickel contest and the coin in general. 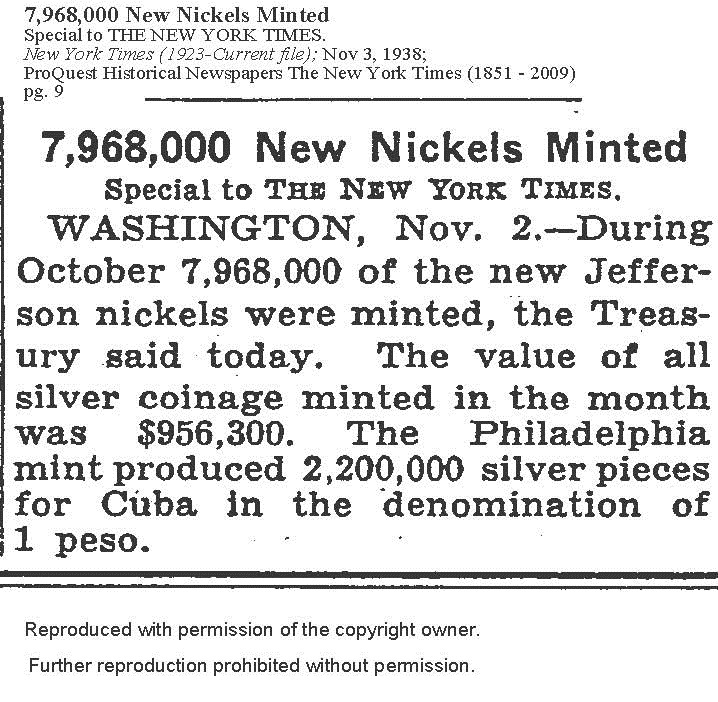 The documents were part of Record Group 104, Records of the U. S. Mint. 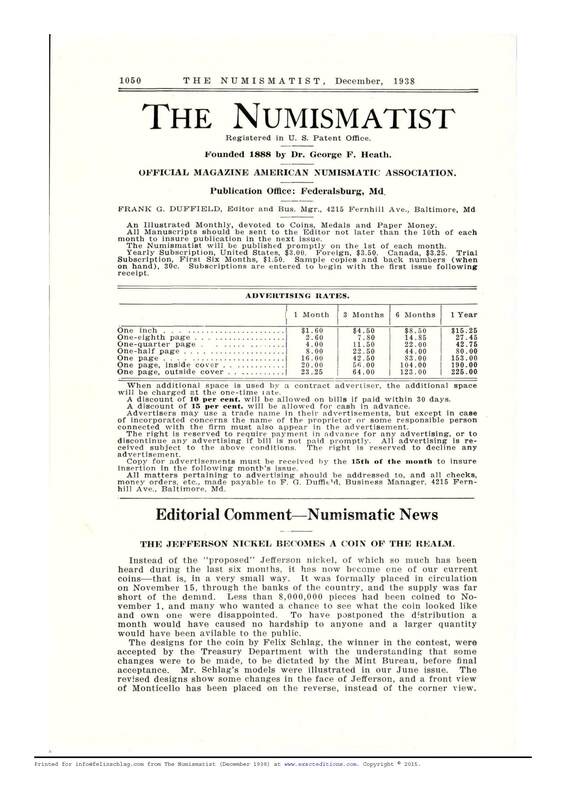 The material has been digitized and organized into a single PDF document that is available upon request. 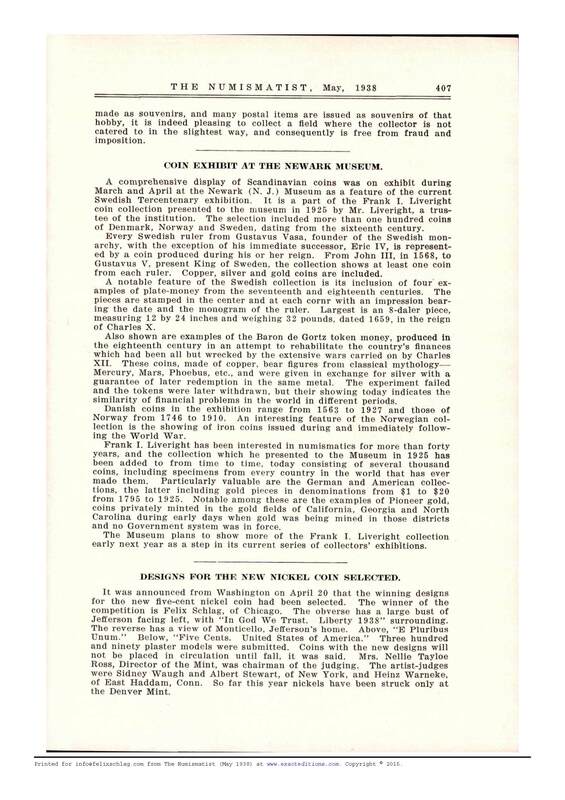 A summary document is available for viewing to give an idea of the scope of the content. 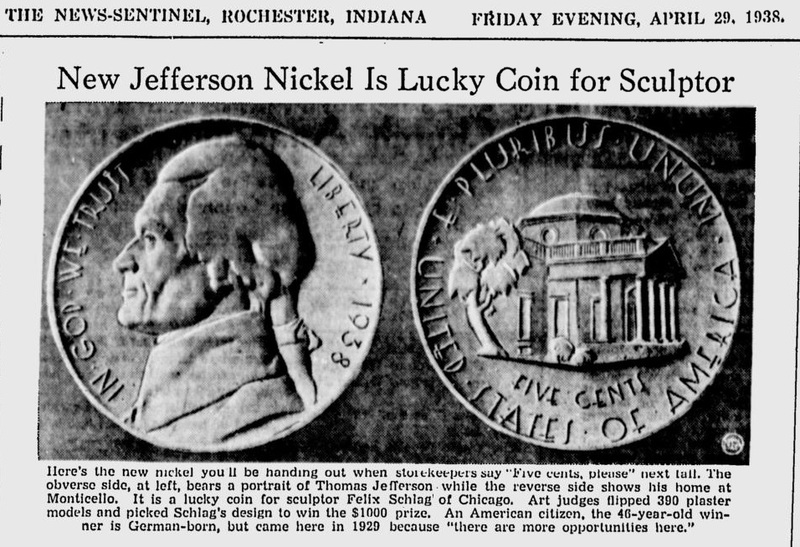 March 2015: A trip to the National Archives, Washington, D.C. yielded more than 80 pages of material pertaining to the Jefferson nickel competition. 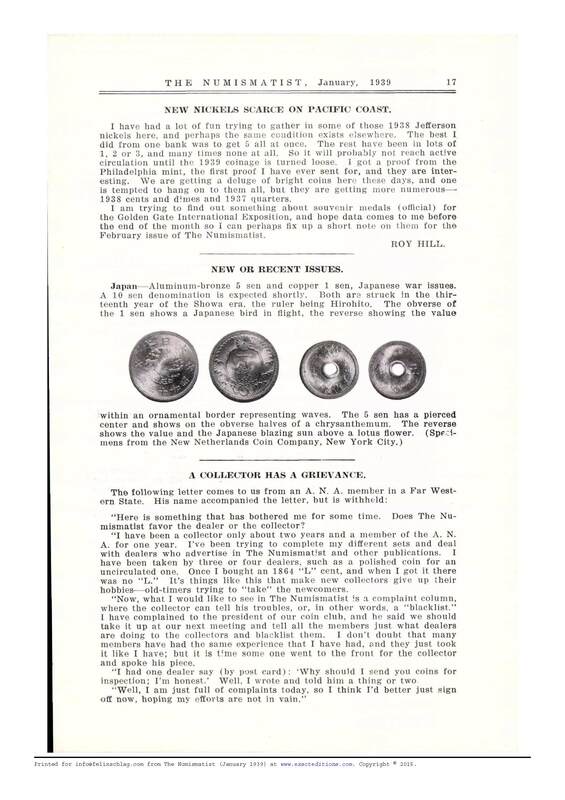 The documents were part of Record Group 66, Records of the Commission of Fine Arts. 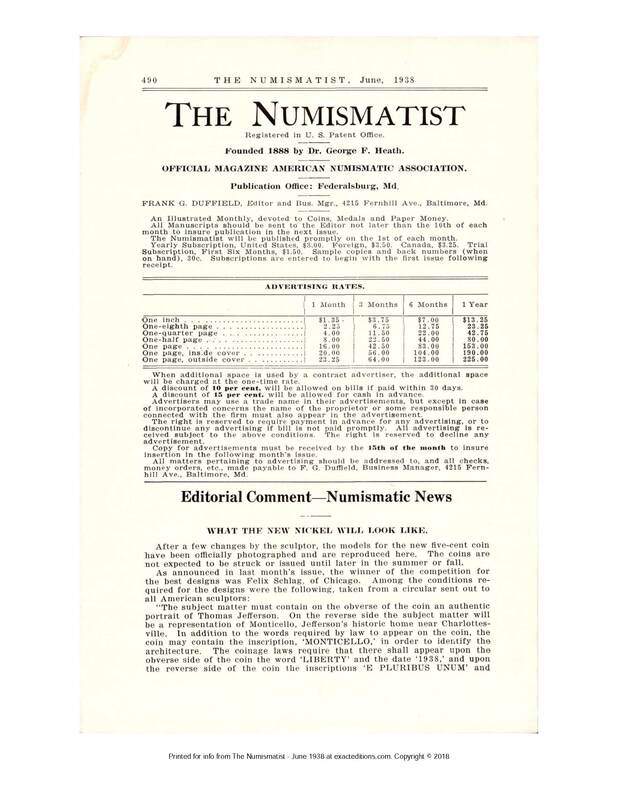 The material has been digitized and organized into a single PDF document that is available upon request. A summary document is available for viewing to give an idea of the scope of the content. 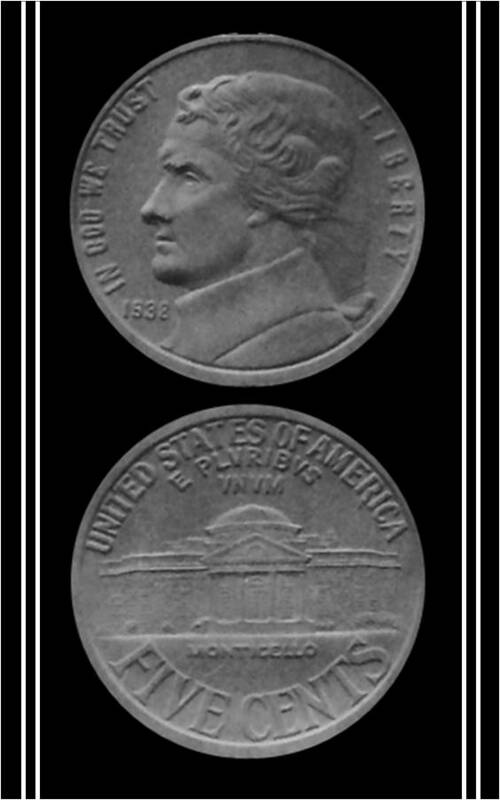 Shortly after the turn of the 20th century, the notion of honoring prominent American political figures in both memorials and on monetary tokens was adopted by various administrations. 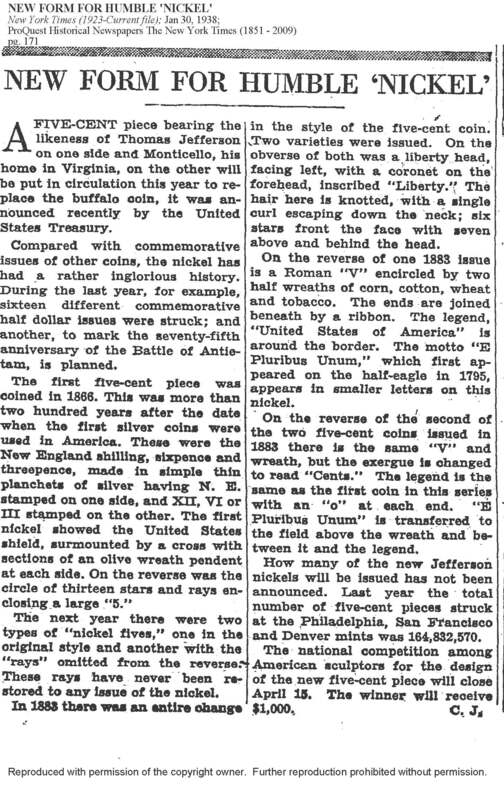 At least in terms of the coinage, the act was seen as a “coming out” of the United States as it ascended on to the international stage and its currency became broadly embraced. 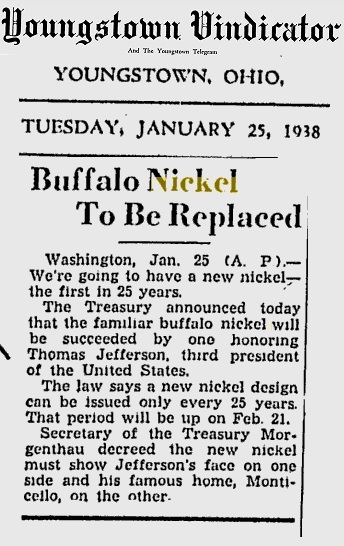 The Buffalo nickel was initially distributed in 1913. 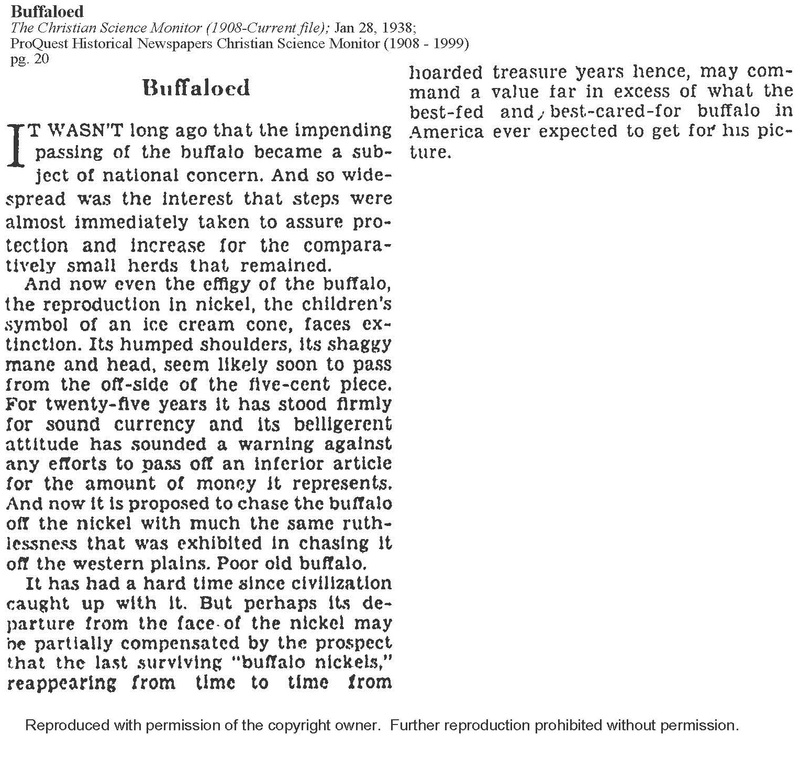 Reviewing closely the language of the 25 Year Rule noting that designs shall survive for "twenty-five years from and including the year of the first adoption" it is clear that James Earl Fraser's design lost legislative protection in 1937; not 1938 as is commonly reported. 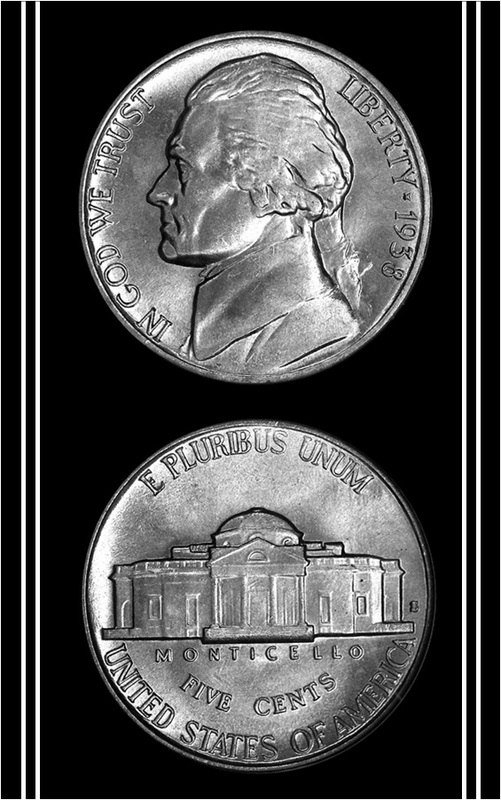 Franklin D Roosevelt (FDR) was inaugurated for his second term in January of 1937, and had the option of both the one and five-cent pieces to modify without an act of congress. 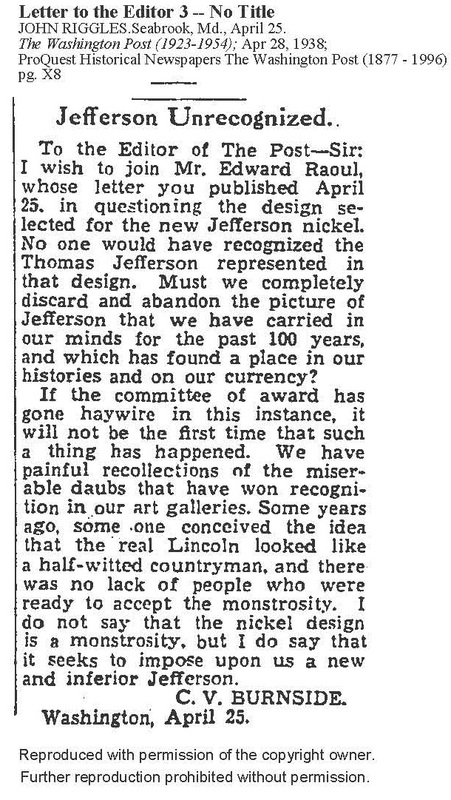 Lincoln's portrait had been on the penny since 1909 and a design change of this coin would likely have been very unpopular. 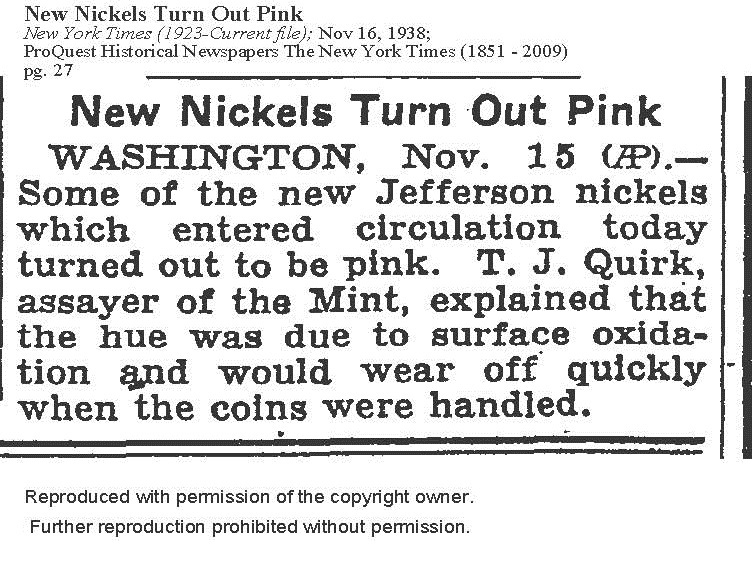 Thus the nickel was his only real option to alter if he chose. 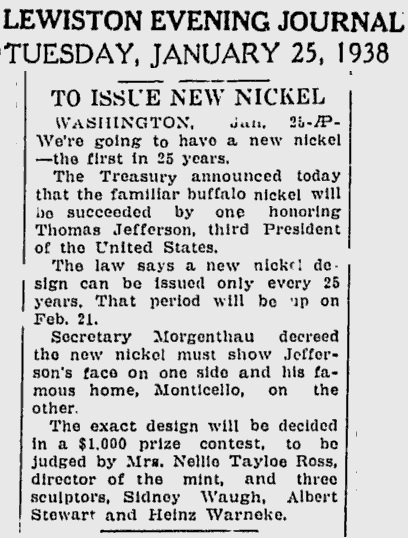 The idea of changing the nickel may have originated in March 1936 with the Baltimore Coin Club. 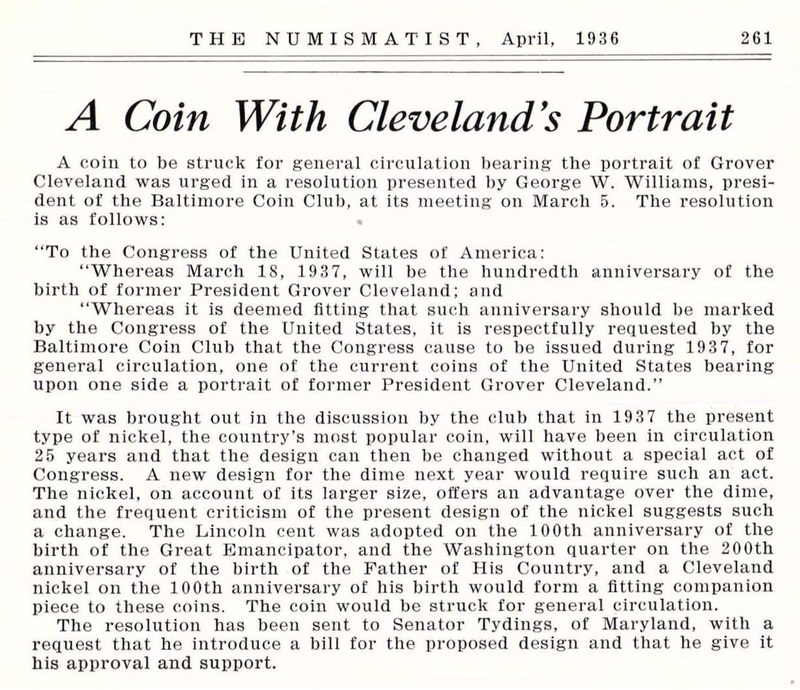 The April 1936 issue of The Numismatist contains text from a letter drafted by the Baltimore Coin Club to Senator Tydings of Maryland. 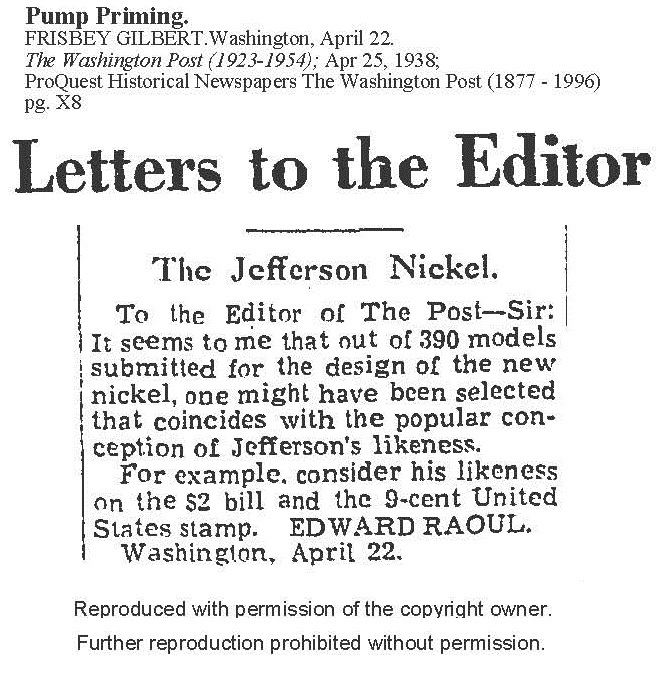 The correspondence points out that 1937 marked the year that the design of the nickel could be altered without special act of Congress and offers that Grover Cleveland should grace one side of the coin. 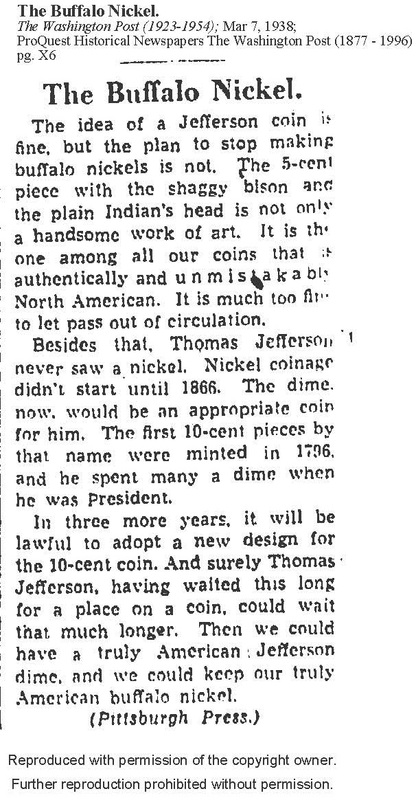 Politics more than anything seem to be at the root of the selection of Thomas Jefferson to adorn U.S. coinage. 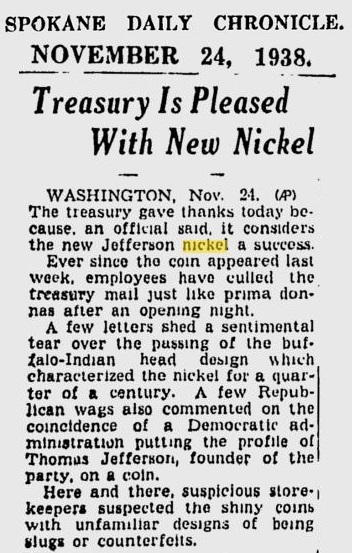 Had Republicans been in office during the 1930’s the face of the nickel might just as easily be Ulysses S. Grant or Theodore Roosevelt. 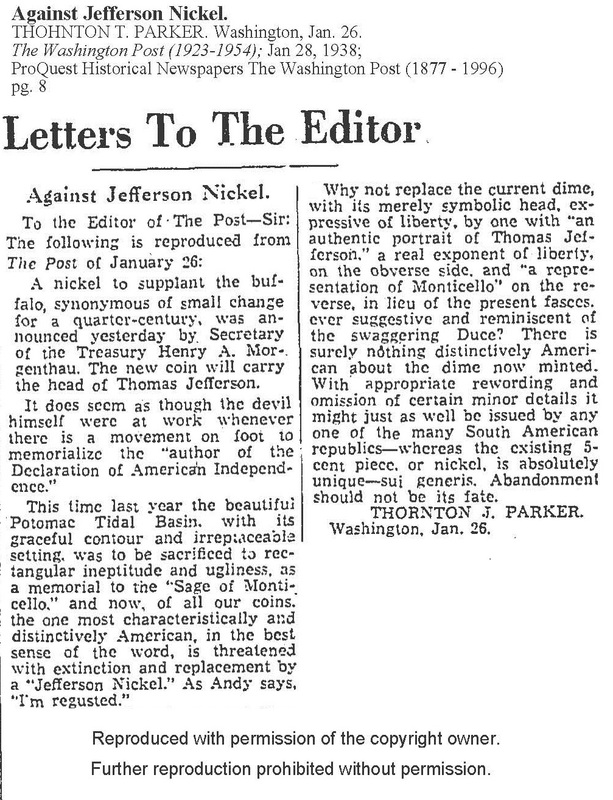 The Democrats were in power though and Jefferson, as father of their party and great champion of the common man, was the statesman they sought to honor. 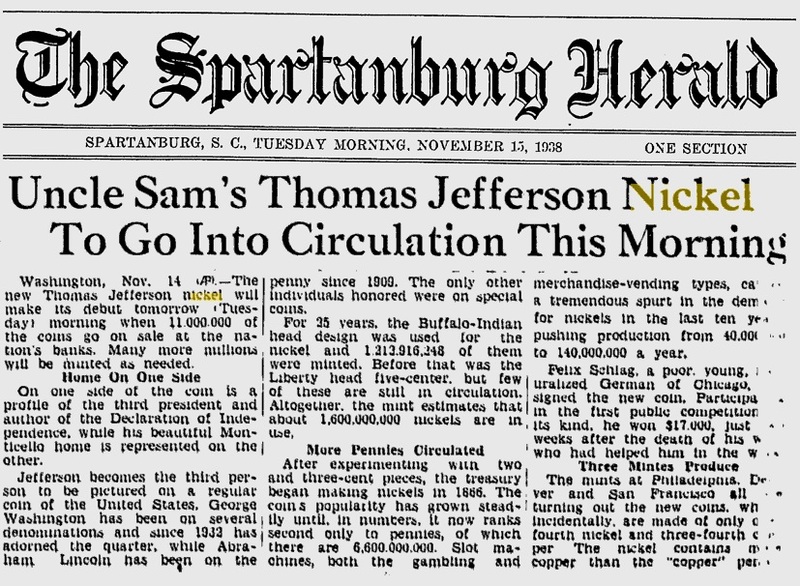 A series of papers from mid to late January 1938 provide some of the puzzle pieces necessary to construct a time line leading to the Jefferson nickel’s birth. 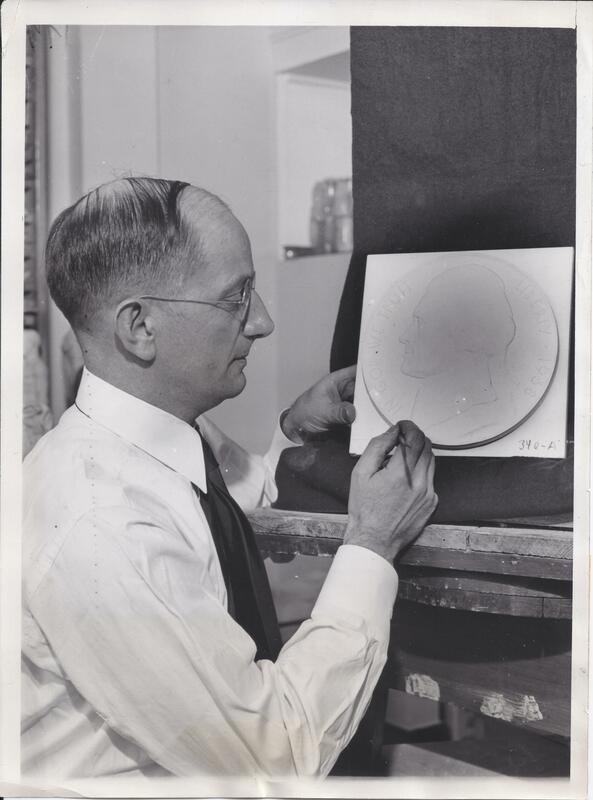 The earliest official documentation found to date is an entry from Henry Morgenthau’s diaries dated January 11, 1938. 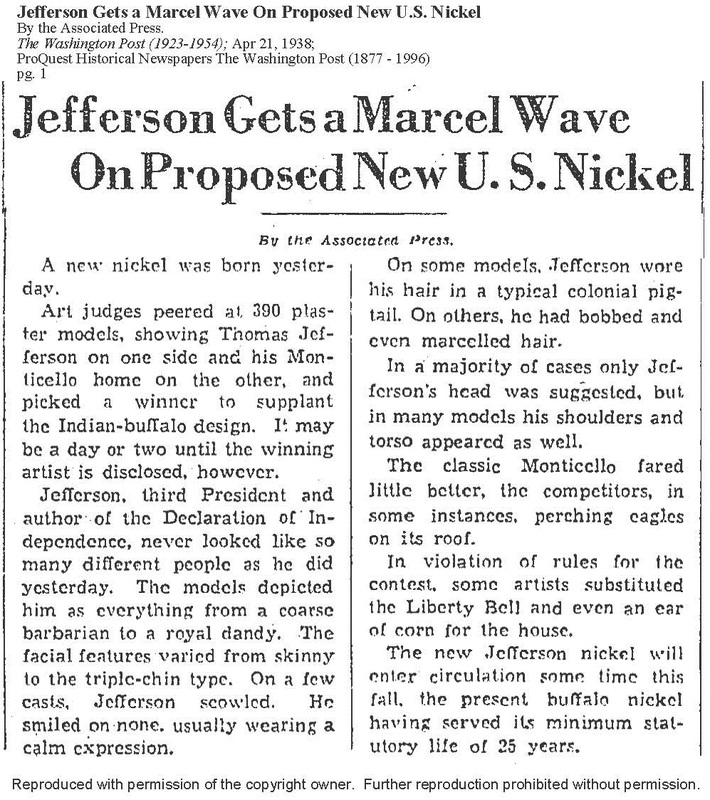 In a group meeting, assistant Secretary of the Treasury, Wayne C. Taylor raised the issue of a Jefferson nickel in a very brief exchange. 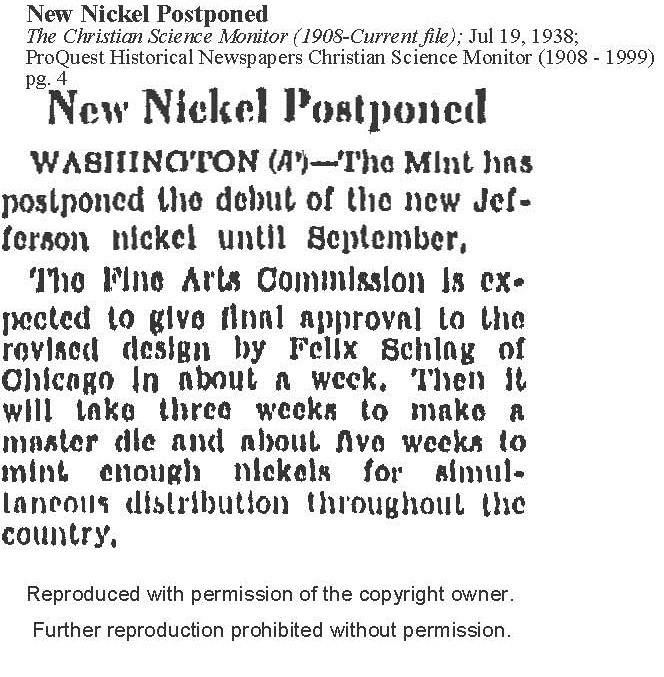 Secretary Morgenthau not only confirms the approval to proceed with the Jefferson nickel national competition, but also suggests that the Lincoln penny was at least considered for replacement. 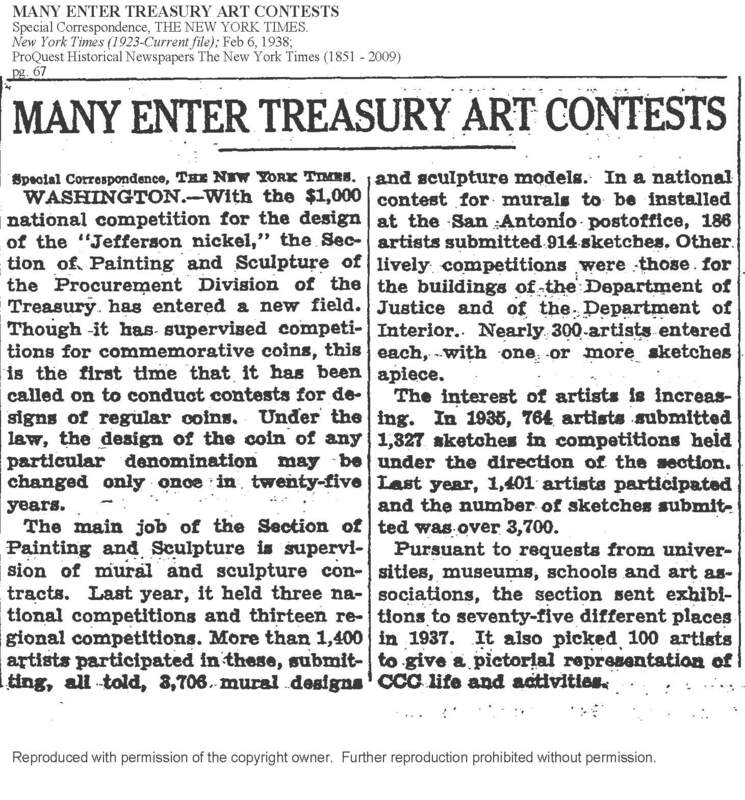 By Monday, January 17, 1938 the Section of Painting & Sculpture had been engaged to oversee the contest. 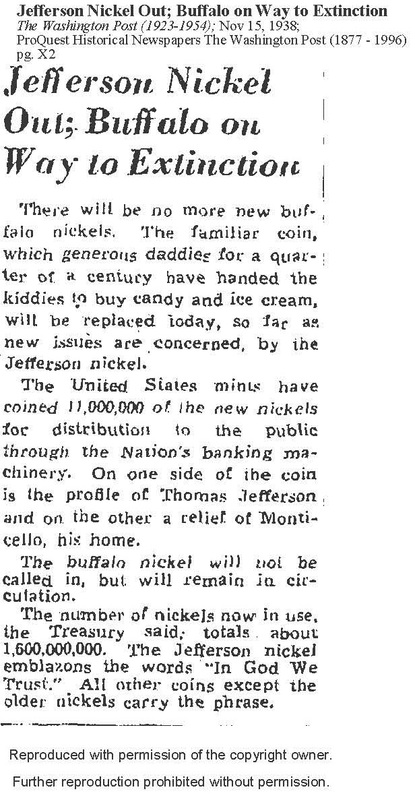 A letter from Edward Bruce, Chief of the Section, to Assistant Director of the Mint, Mary O’Reilly, “confirm[s] the arrangement which we made to hold a national competition for the new five-cent coin.” This implies that sometime during the latter half of the week of January 10, 1938 the Mint was notified of the intent to put the beloved Buffalo out to pasture and instructed to work with the Section to initiate the competition. 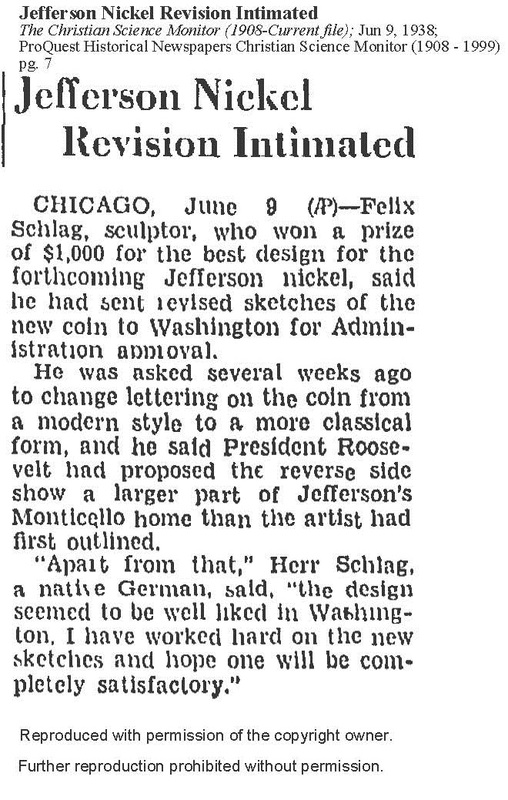 A few days later, on January 20th, Superintendent of the Section of Painting & Sculpture, Edward Rowan would provide Ms. O’Reilly with a draft of the “Form Announcement” that would be issued alongside the official press release declaring a “National Competition for [the] New Design for [the] Five Cent Coin Open to All American Sculptors.” The press release indicated that it should be released to the afternoon newspapers on January 25, 1938. 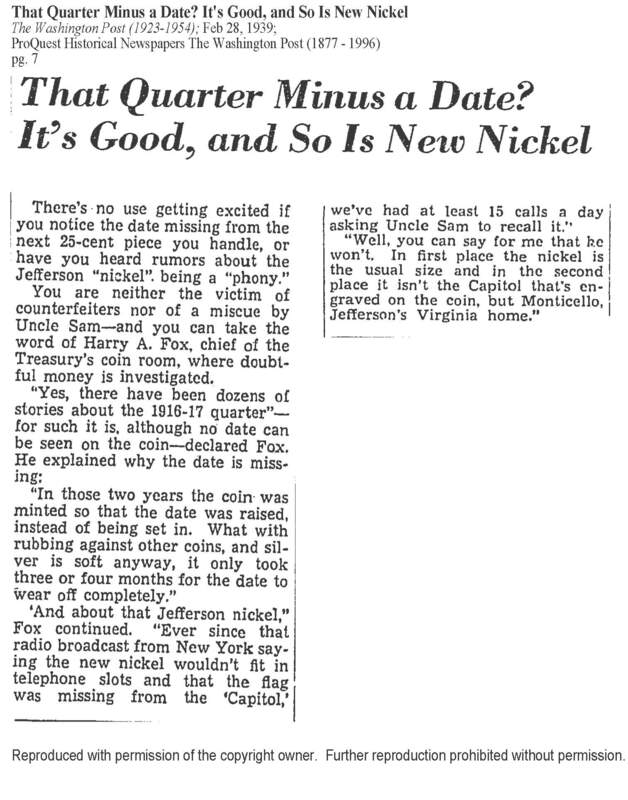 The next piece of hard evidence that grants insight into the nickel’s blueprint again comes from the diaries of Henry Morgenthau. 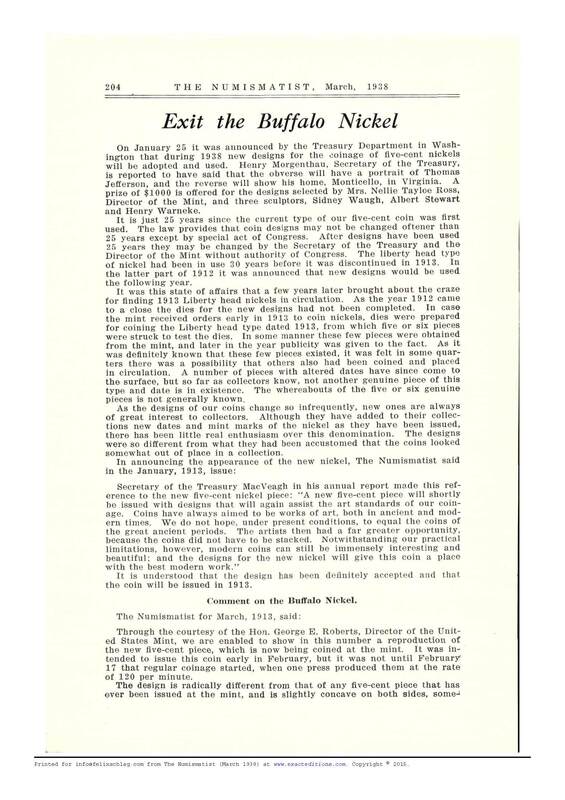 The record is from the January 24, 1938 group meeting and is one of the most telling of all documents located to date. 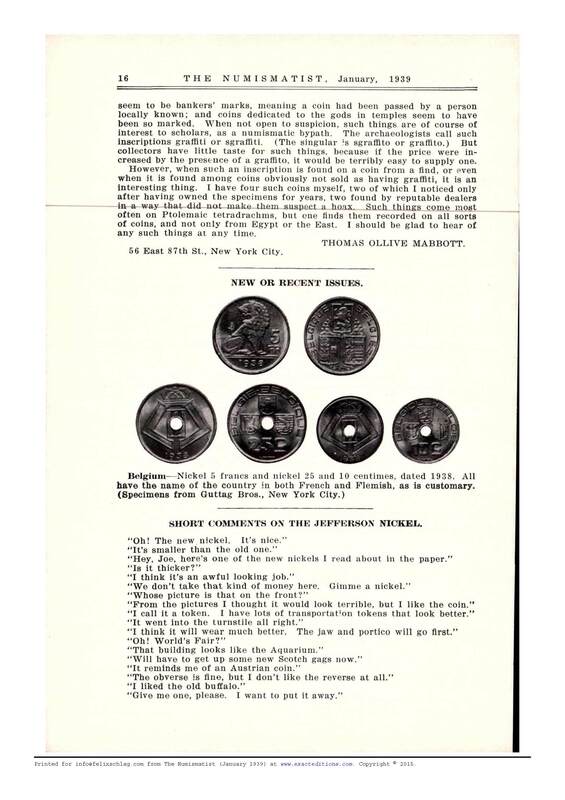 An exchange between Morgenthau, Treasury public relations officer, Henry Gaston; acting Director of the Bureau of the Budget, Danny Bell; and General Counsel of the Treasury, Herman Oliphant focused on the five cent piece. 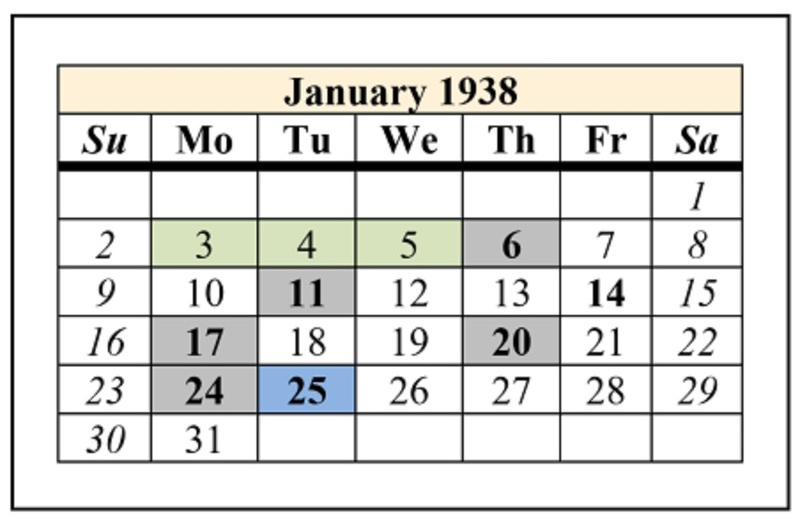 A review of FDR’s daily calendar confirms that a cabinet meeting was held on January 6, 1938; just a few days prior to Morgenthau’s group meeting in which Wayne Taylor first raised the subject of the nickel. 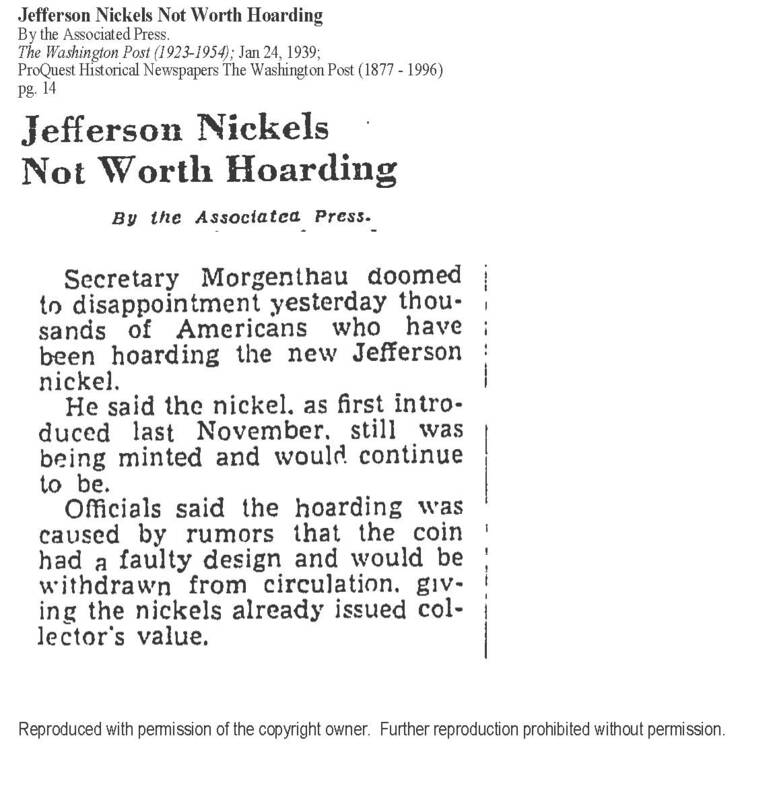 The next cabinet meeting was not held until January 14, and records confirm that Morgenthau was not in attendance. 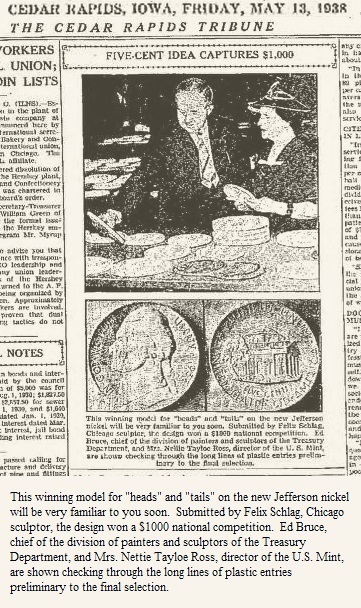 This means that the most probable cabinet meeting where the approval for the Jefferson nickel was obtained was the January 6th gathering; FDR’s first of 1938. Unfortunately, archivists at the Roosevelt library have confirmed that there exist no minutes from FDR’s cabinet meetings which could be drawn on to validate this theory. 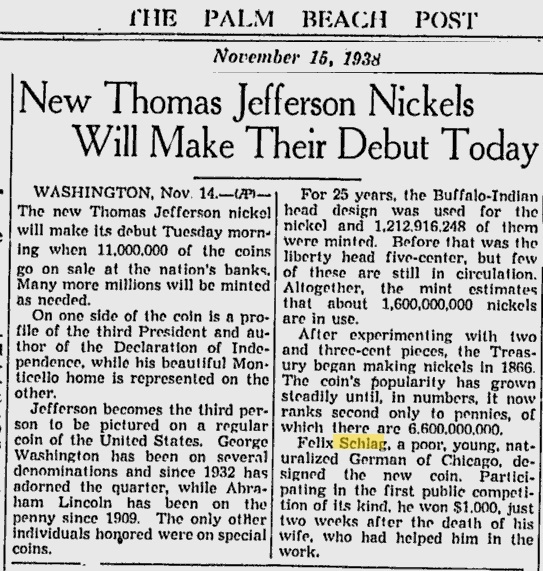 For lack of any other verifiable evidence, it seems safe to posit that the Jefferson nickel was conceived by Henry Morgenthau, with some input from at least Danny Bell, in the days just prior to FDR’s January 6, 1938 cabinet meeting where it was ultimately approved. 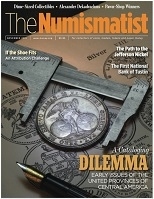 A detailed account of activities leading up to the birth of the Jefferson Nickel, entitled The Path to the Jefferson Nickel, was originally published in the November 2015 issue of The Numismatist. 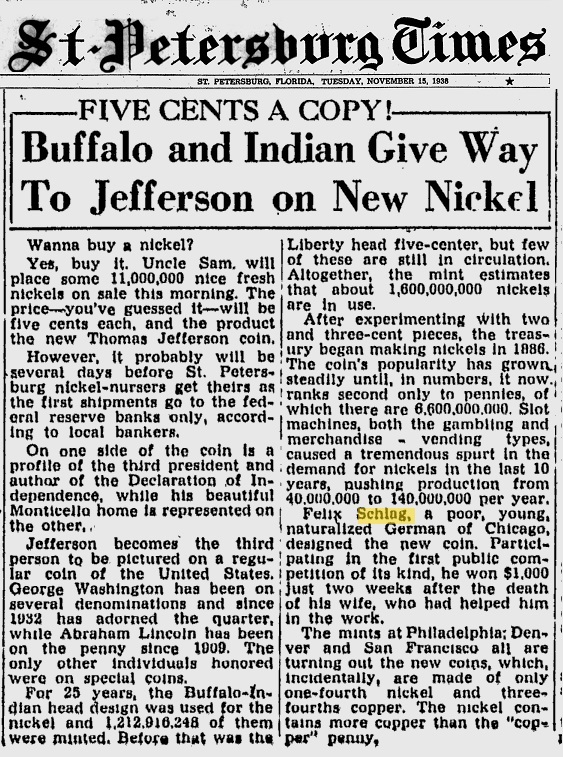 The United States Treasury announced in January 1938 the open competition for the design of the new five-cent coin to be called the "Jefferson nickel." 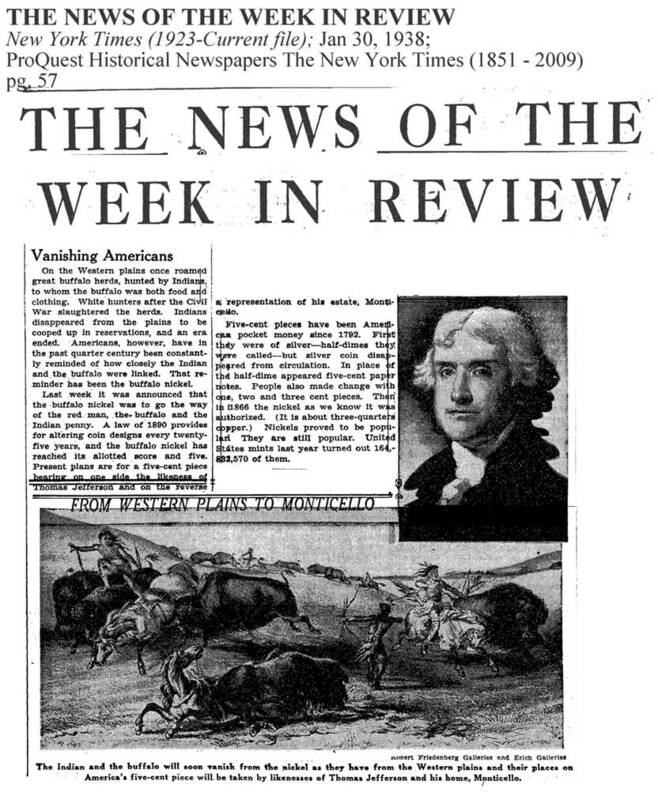 Multiple newspapers across the nation carried an Associated Press (AP) article indicating the contest notice was officially released on January 25, 1938. 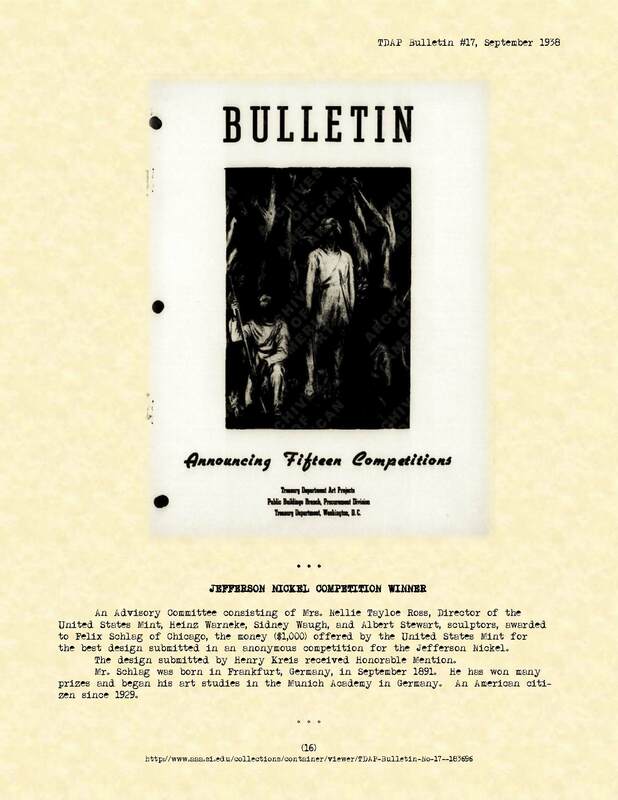 During this same time, The Treasury Department Art Projects (TDAP) released Bulletin #14, reporting to the public its activities for the period of July 1937 - January 1938. 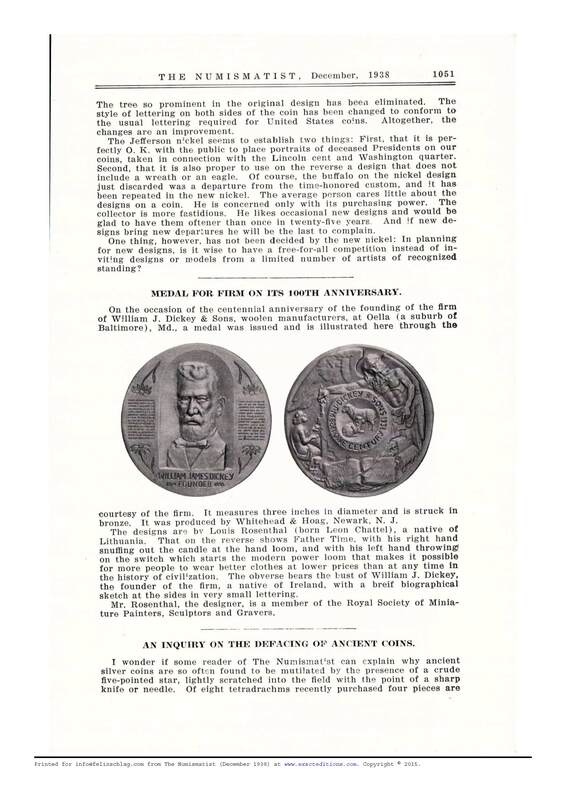 Inside this pamphlet, the competition for a new U.S. coin was found on page 3. Presumably, this is the release the AP reported on. Prospective participants were strongly encouraged to request the detailed form announcement before commencing work on the coin design. 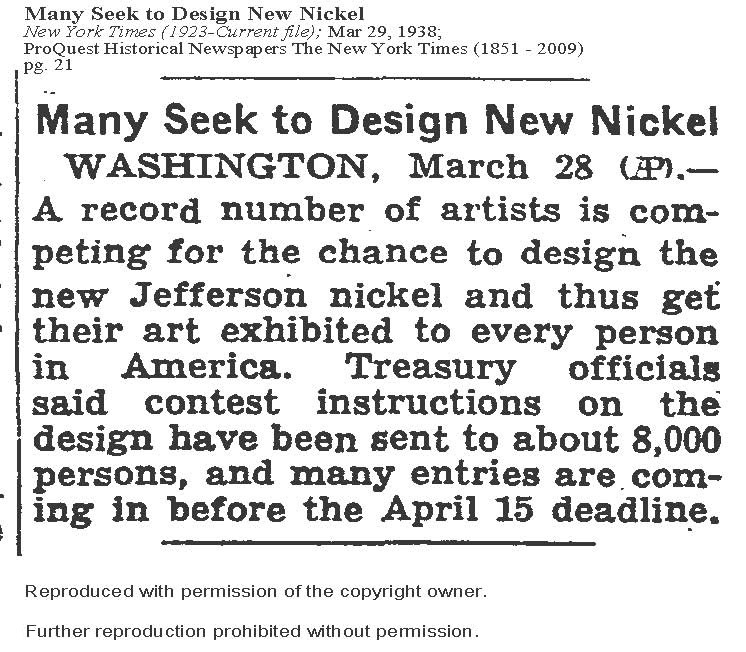 According to a March 28, 1938 AP report, the "contest instructions were sent to nearly 8,000 persons." 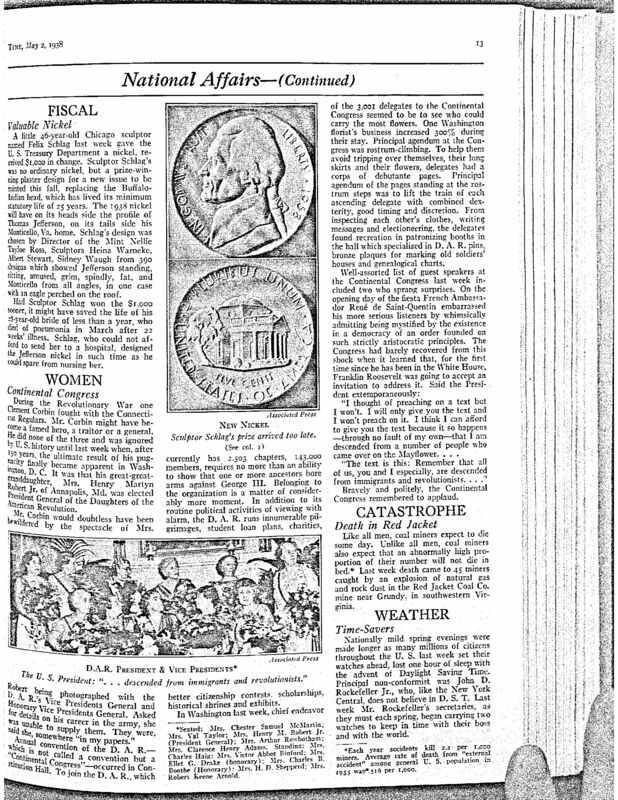 Below is a selection of clippings from January 1938 - February 1939 covering the announcement of the contest, the proclamation of the winner, commentary on the design, and the release of the coin. Hover over an image to zoom in and click on it to open in a new window. All content has been reproduced with the permission of the respective copyright holder. Further reproduction without permission is prohibited. 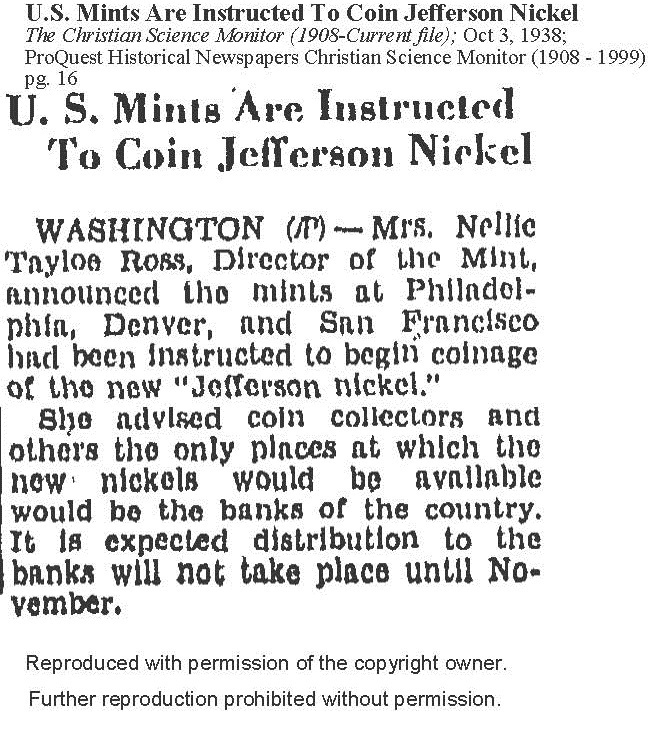 On January 26, 1938, a day after the competition was formally announced, Josef Israels of Radio Newsreel sent a telegram to Director of the Mint, Nellie Tayloe Ross requesting an interview on January 30. 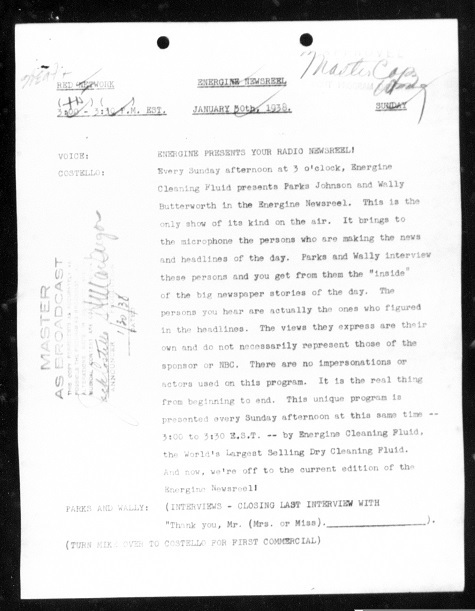 Over the coming days, numerous telegrams were exchanged to coordinate the event. 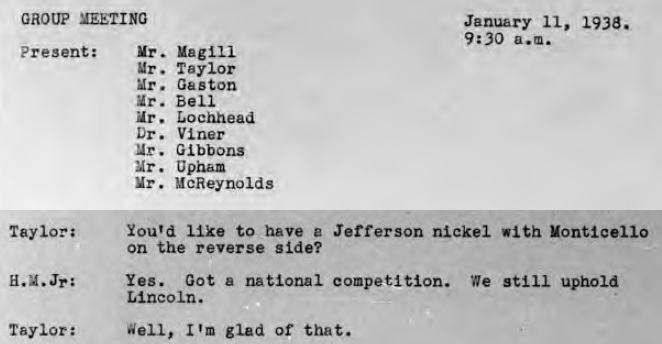 The interviewers, Parks Johnson and Wally Butterworth would broadcast from New York and Nellie Ross would participate from Washington, D.C. 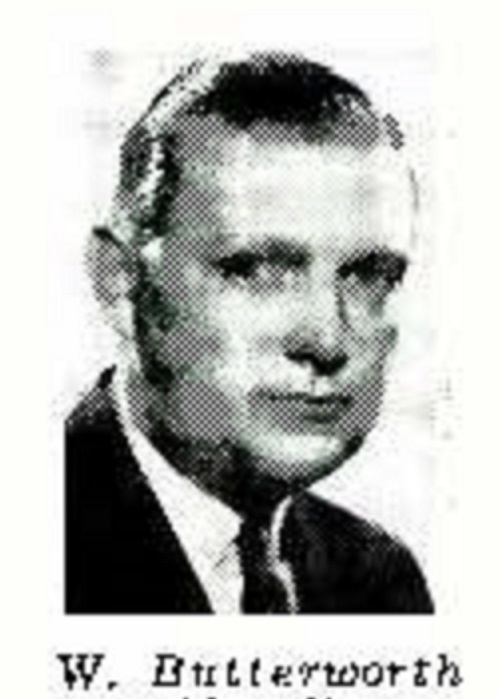 The Energine Radio Newsreel with Parks Johnson and Wally Butterworth was a weekly broadcast on the NBC Red Network originating from New York every Sunday from 3:00 - 3:30 PM EST. 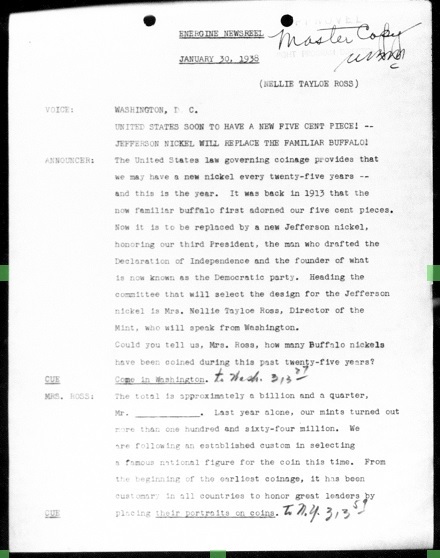 Below is a transcript of the broadcast that was located with in the radio archives at the Library of Congress. Unfortunately, an audio recording of the show has not been located. 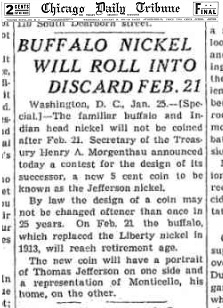 JEFFERSON NICKEL WILL REPLACE FAMILIAR BUFFALO! 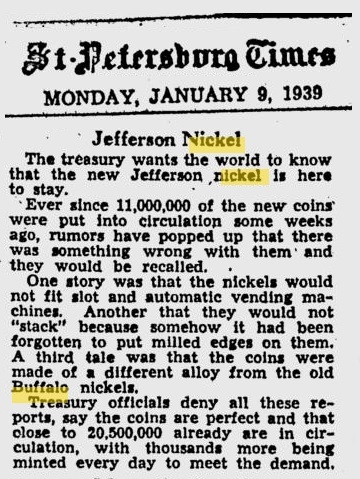 ANNOUNCER: The United States law governing coinage provides that we may have a new nickel every twenty-five years – and this is the year. 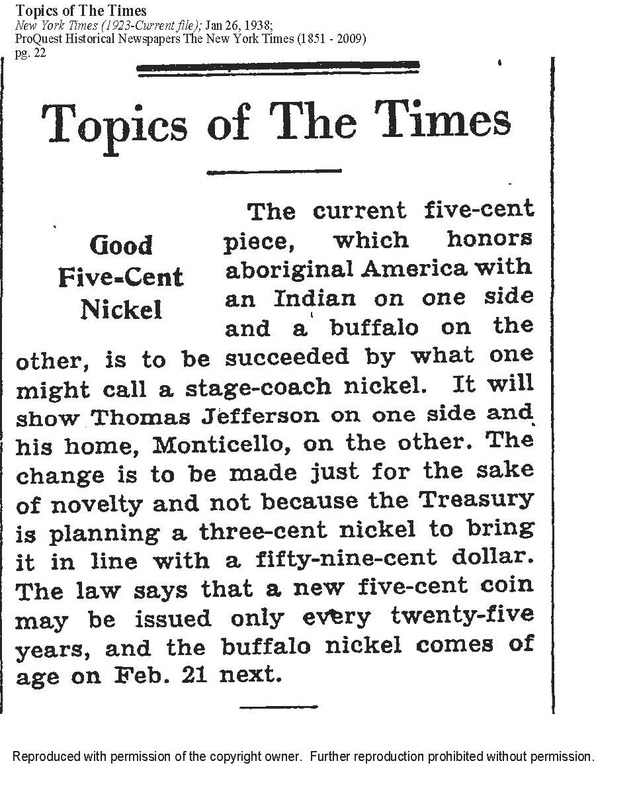 It was back in 1913 that the now familiar buffalo first adorned our five cent pieces. 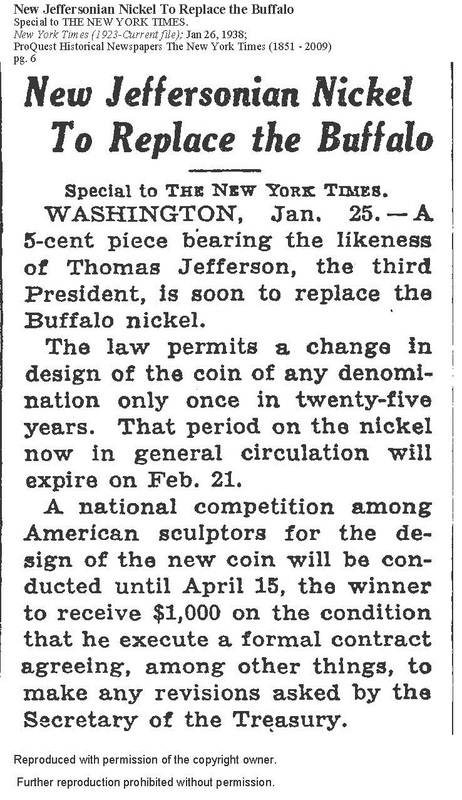 Now it is to be replaced by a new Jefferson nickel, honoring our third President, the man who drafted the Declaration of Independence and the founder of what is now known as the Democratic party. 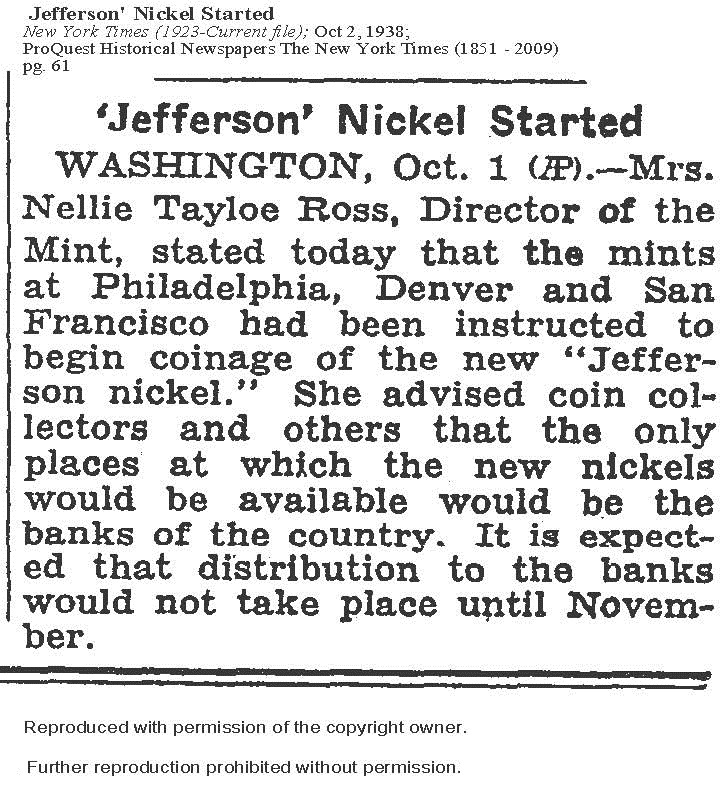 Heading the committee that will select the design for the Jefferson nickel is Mrs. Nellie Tayloe Ross, Director of the Mint, who will speak from Washington. 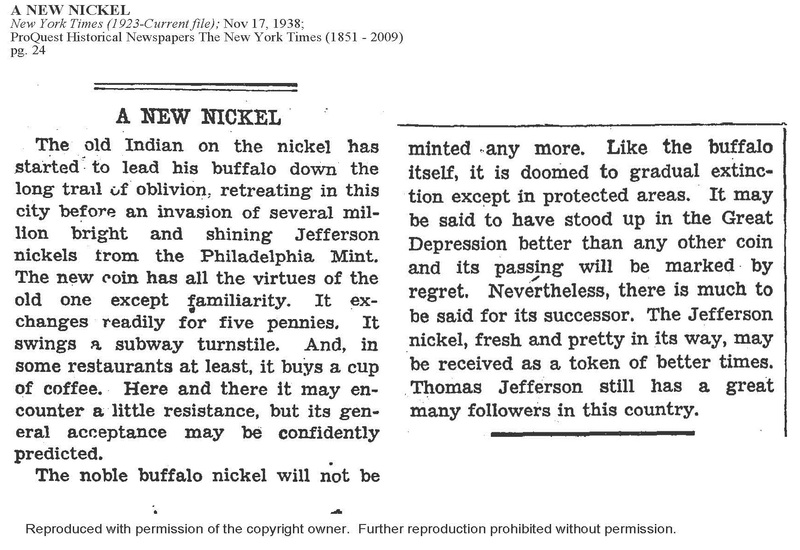 Could you tell us, Mrs. Ross, how many Buffalo nickels have been coined during this past twenty-five years? ANNOUNCER: Thank you, Mrs. Nellie Tayloe Ross, for this interview. 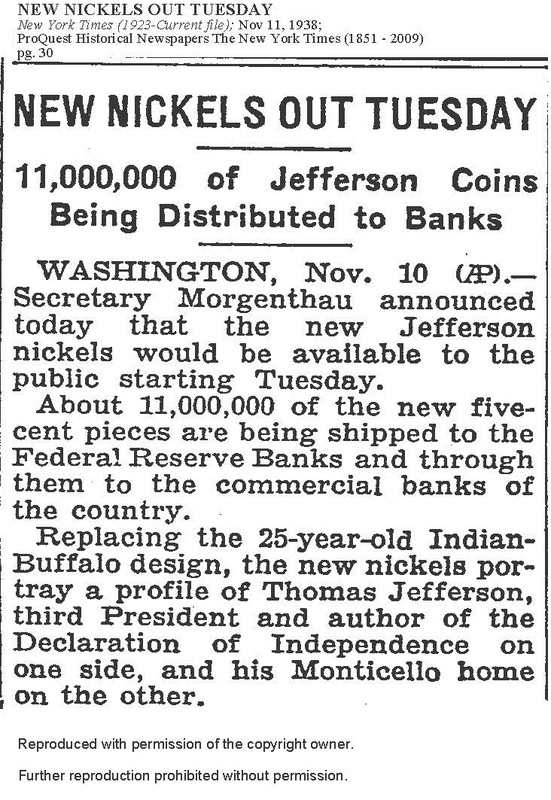 We’ll all be watching for those bright new nickels. 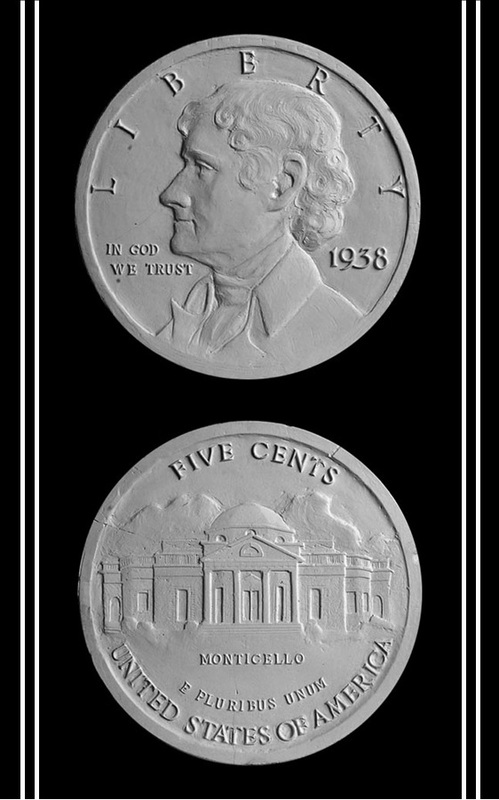 The Treasury Department, Procurement Division, Section of Painting and Sculpture invites competition for designs for a new five cent coin to be known as the “Jefferson Nickel.” This competition is open to all American sculptors. 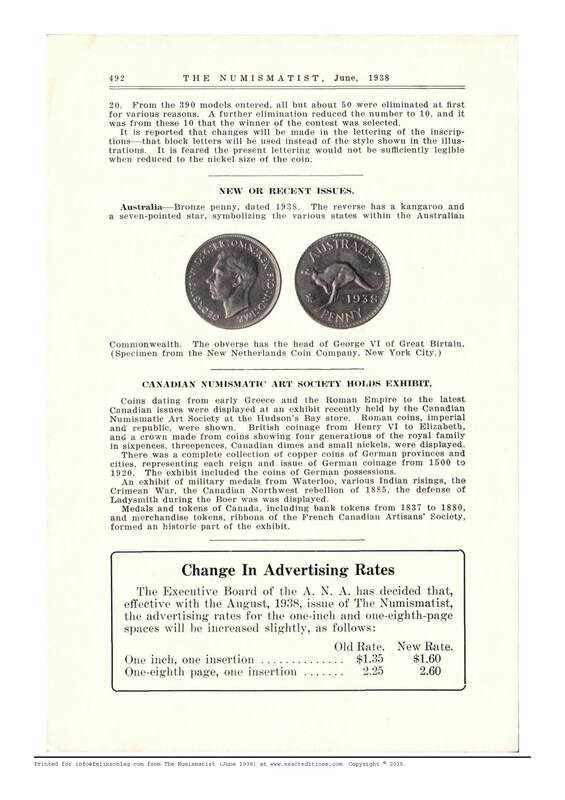 Prospective competitors are herewith warned that there are specific legal and other conditions which must be accurately complied with in carrying out a model for a coin competition. 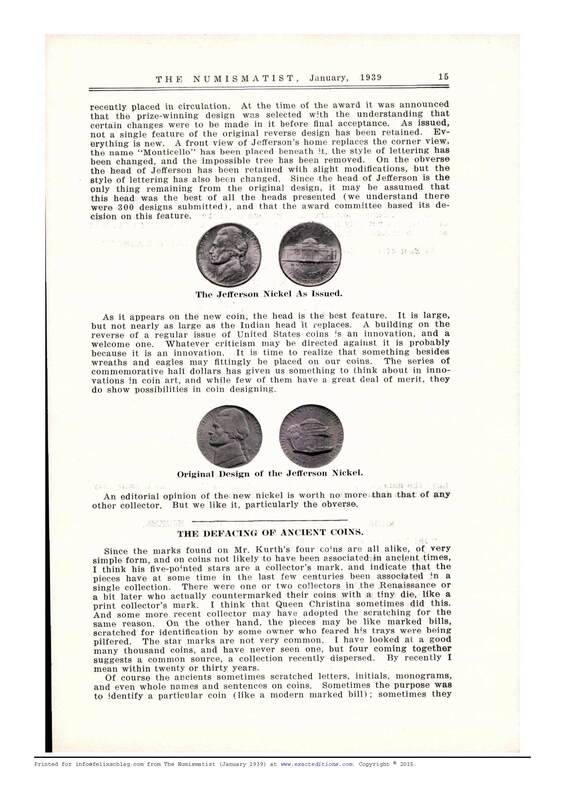 It is, therefore, of first importance that before taking any further steps in this competition the competitor should write to the Section of Painting and Sculpture for a statement of the legal requirements affecting the designing of United States coins. The sum of $1,000 is to be paid to the winner of the competition. 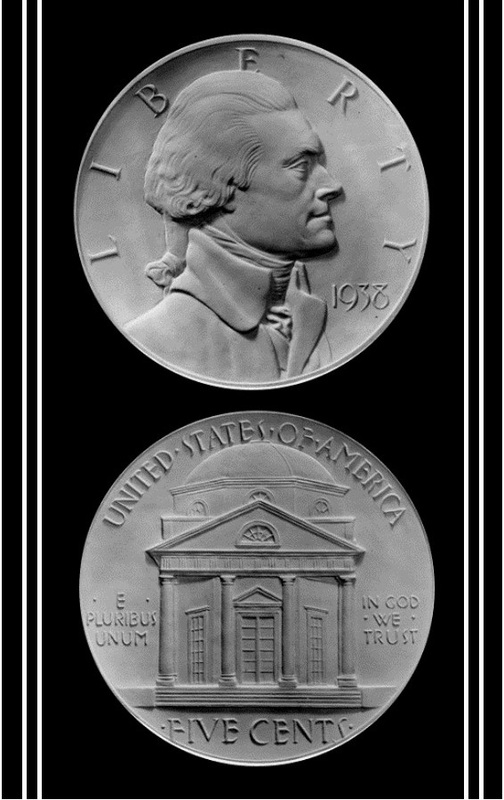 The sculptor whose designs win will be required to execute a formal contract with the Treasury Department agreeing, among other things, to make any revisions required by the Secretary of the Treasury. The models should not be signed. They should be accompanied by a plain, sealed envelope, enclosing the sculptor’s name and address. These envelopes will be carefully numbered when received with the same number as the designs they accompany and will remain unopened until after selection of the best designs. 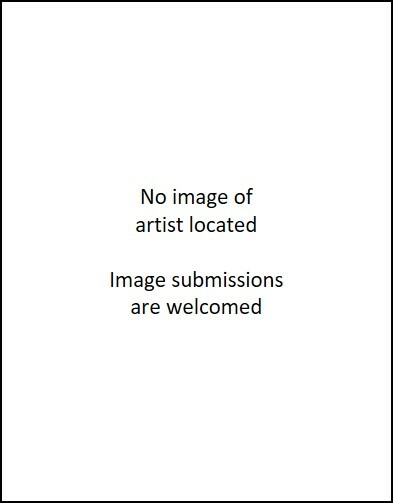 The conditions stated herein are part of the detailed instructions (regarding subject matter, size of model, coinage rules, etc.,) which will be found in the Form Announcement that every artist may secure on request. For this reason each prospective competitor is again advised that before entering the competition he MUST secure a FORM ANNOUNCEMENT. 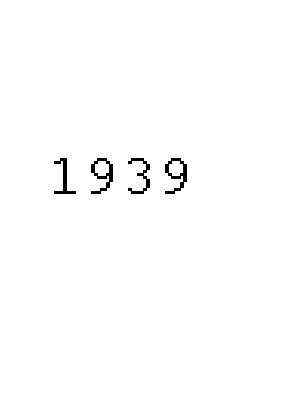 THE COMPETITION WILL TERMINATE APRIL 15, 1938. 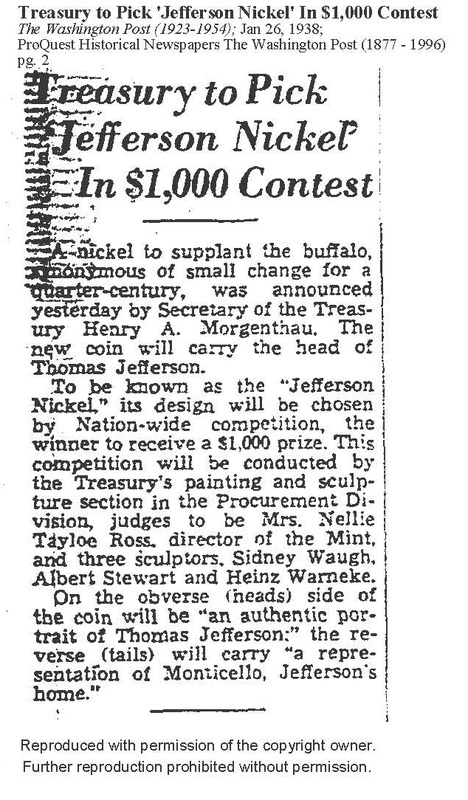 The competition requirements are that a sculptor entering the competition must submit two plaster models, one representing the obverse and one the reverse of the coin. The sum of $1,000 is to be paid to the winner. 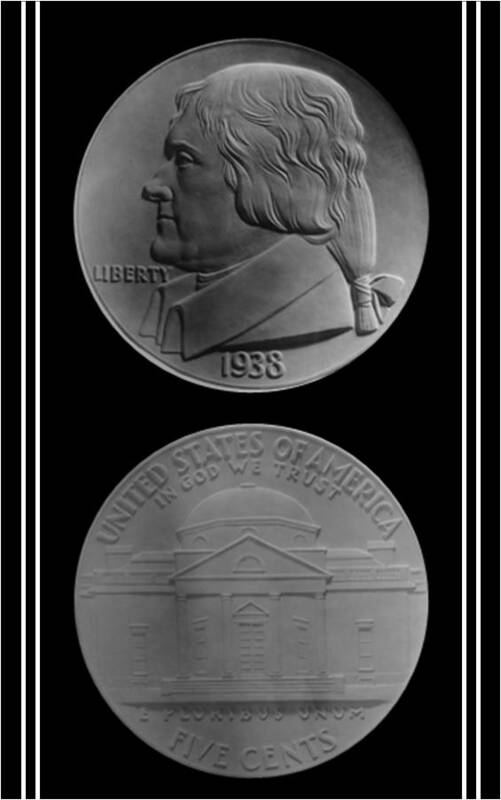 Thesculptor whose designs win the competition will be required to execute a formal contract with the Treasury Department, agreeing to make any revisions required by the Secretary of the Treasury. The models should not be signed. 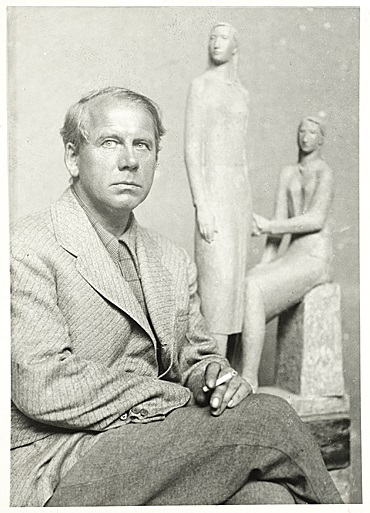 They should be accompanied by a plain, sealed envelope, enclosing the sculptor’s name and address. These envelopes will be carefully numbered when received with the same number as the designs they accompany and will remain unopened unless they conform strictly with the foregoing conditions. Any sculptor may submit as many designs as he desires. Should he submit more than one set of designs he should remember to send a sealed envelope with his address with each entry. 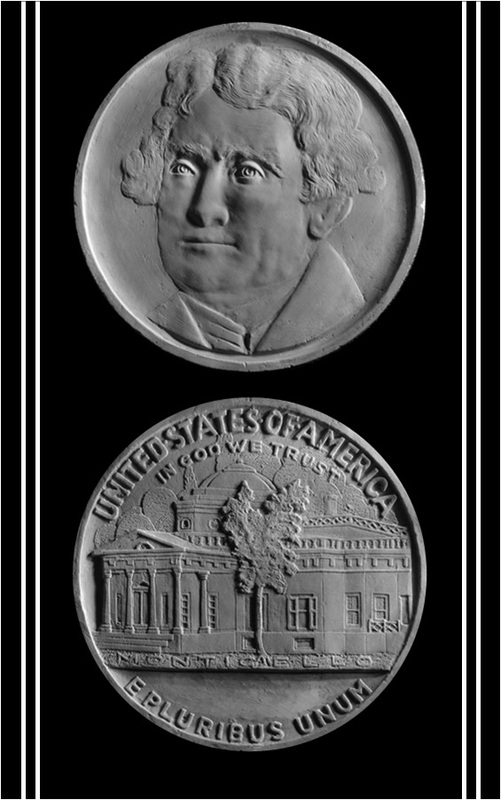 The subject matter must contain on the obverse of the coin an authentic portrait of Thomas Jefferson. 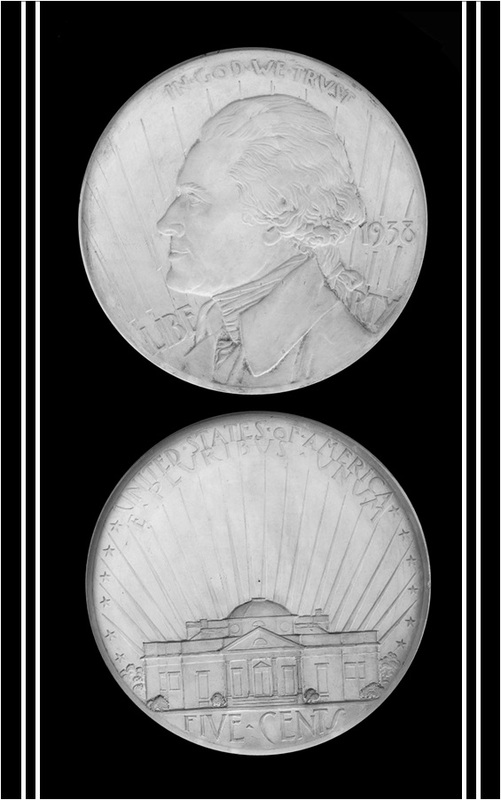 On the reverse side the subject matter will be a representation of Monticello, Jefferson’s historic home near Charlottesville. 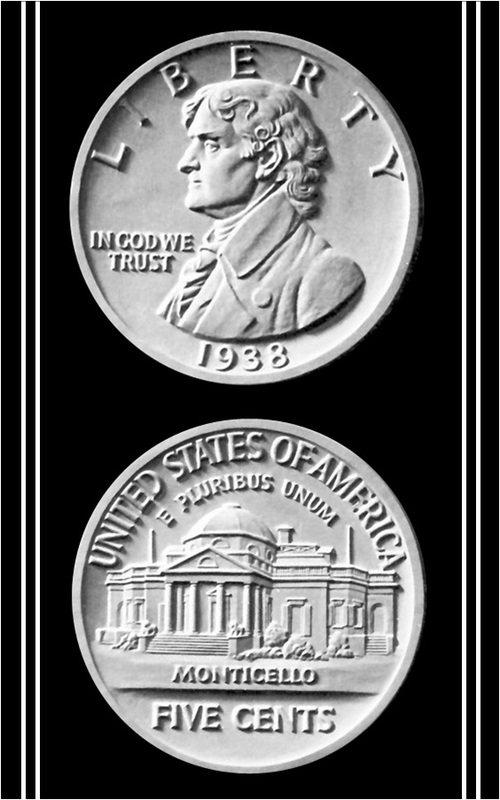 In addition to the words required by law to appear on the coin, the coin may contain the inscription “MONTICELLO,” in order to identify the architecture. 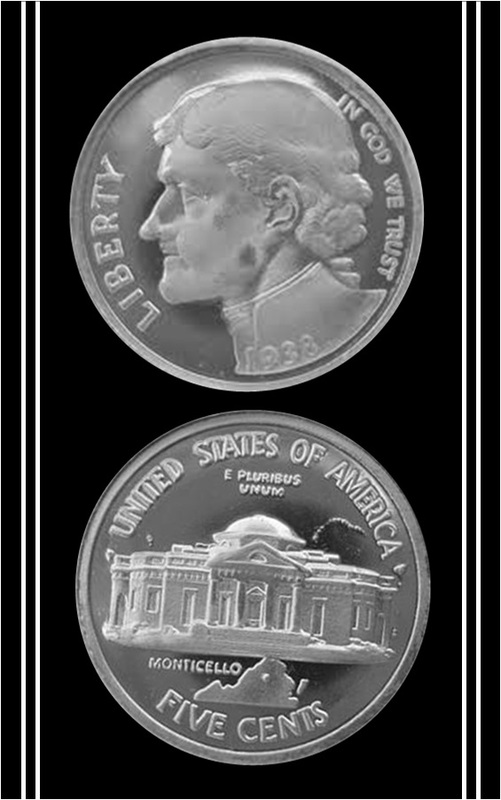 The coinage laws require that there shall appear upon the obverse side of the coin the word “LIBERTY” and the date “1938,” and “UNITED STATES OF AMERICA,” and the denomination “FIVE CENTS.” The coin should also contain the motto “IN GOD WE TRUST.” None of the legends are to be abbreviated and should be all in capital letters. 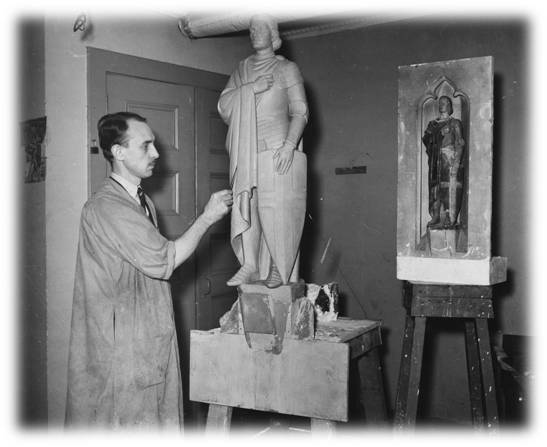 Neither the United States of America nor any officer, agency, agents, or employee thereof shall be liable to the sculptor for the use by any person of any idea, plan, or design, expressed or executed by the sculptor in connection with the work. 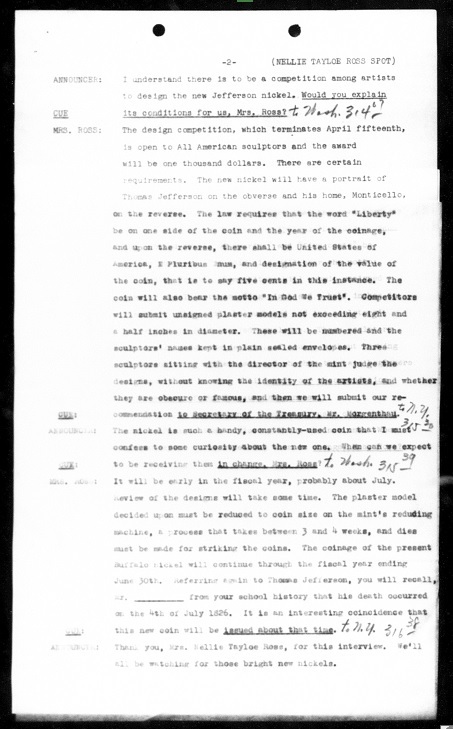 Competitors are invited to participate in this competition subject to the condition, in view of the provisions of the laws of the United States, that any and all sketches, designs, molds, models, and the like, made by them in connection with such competition, whether or not submitted, be delivered to the committee by not later than April 15, 1938 so that they may be ultimately delivered to a representative of the Treasury Department for destruction or such other disposition as the Department may see fit to make of them. 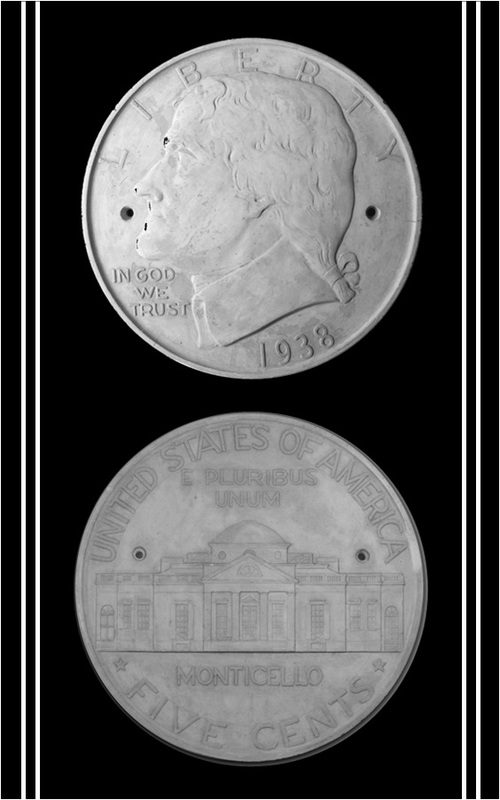 The Treasury Department shall be under no obligation to show, exhibit, or preserve the work of any sculptor. 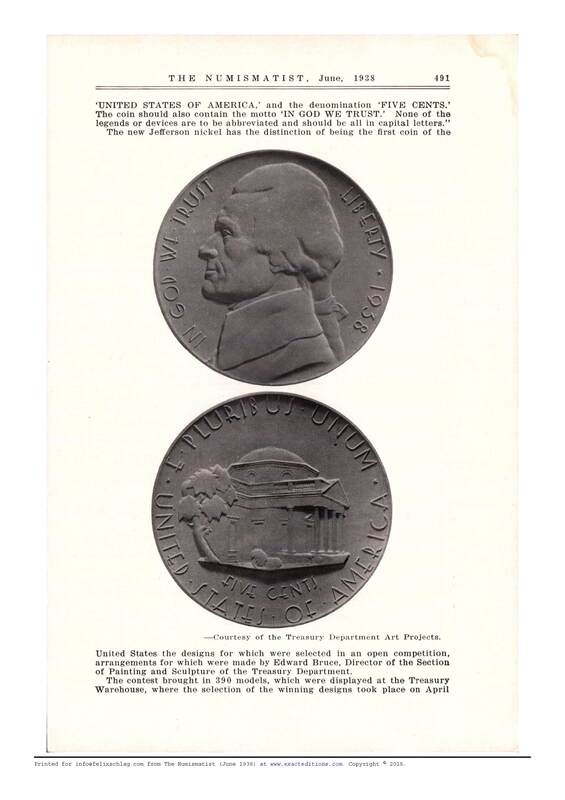 The models in order to be acceptable to the Treasury Department must be of plaster and should not exceed 8½ inches in diameter and should be executed in such a manner as to be suitable for coinage purposes. 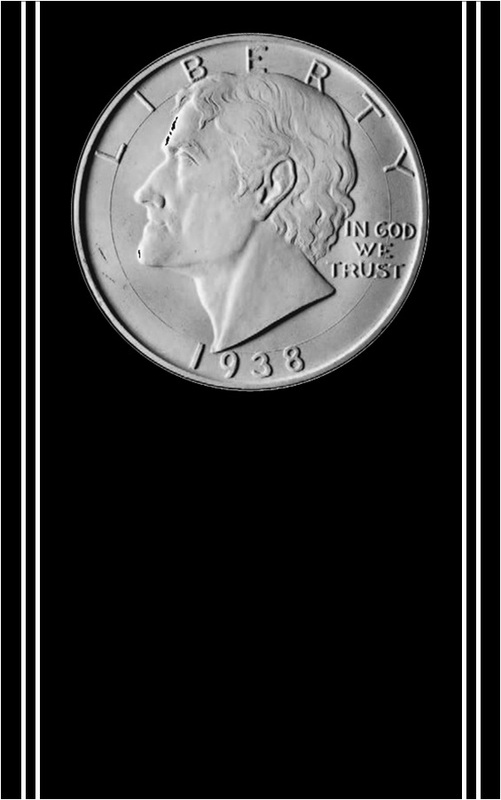 The background or field should have a slight radius, that is, the background must curve slightly from the center to meet the edge of the coin or border. 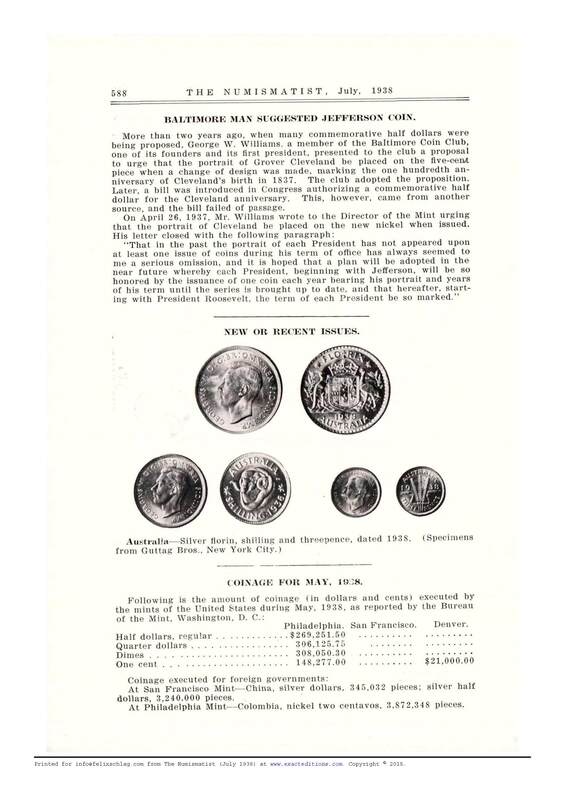 A model with an absolutely flat background would be practically impossible to coin. The extreme depth of relief from the border to the deepest part should not exceed 5/32 of an inch and the highest part of the design should be kept slightly under the level of the border. The competition will terminate April 15th, on which date the models should have been delivered, carrying charges prepaid, to the Section of Painting and Sculpture, Procurement Division, Treasury Department, Washington, D.C. If no designs are submitted which are of sufficient merit to justify an acceptance, no contract will be awarded as a result of this competition. Photographs of a front and side view of Monticello are available and may be obtained by writing to the Section of Painting and Sculpture. 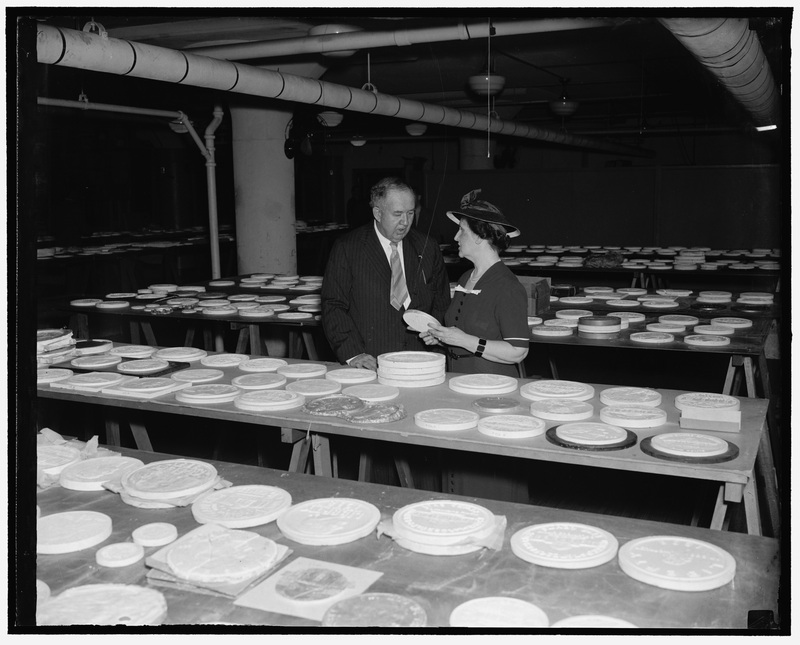 In April of 1938, Edward Bruce (left), Director, Section of Painting and Sculpture, and Nellie Tayloe Ross (right), Director of the Mint, reviewed the plaster models submitted by the April 15th deadline. 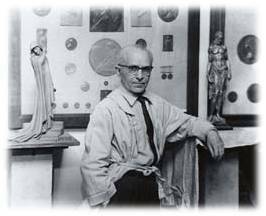 Sculptors, Sidney Waugh, Albert Stewart, and Heinz Warneke assisted in the judging and selection process. 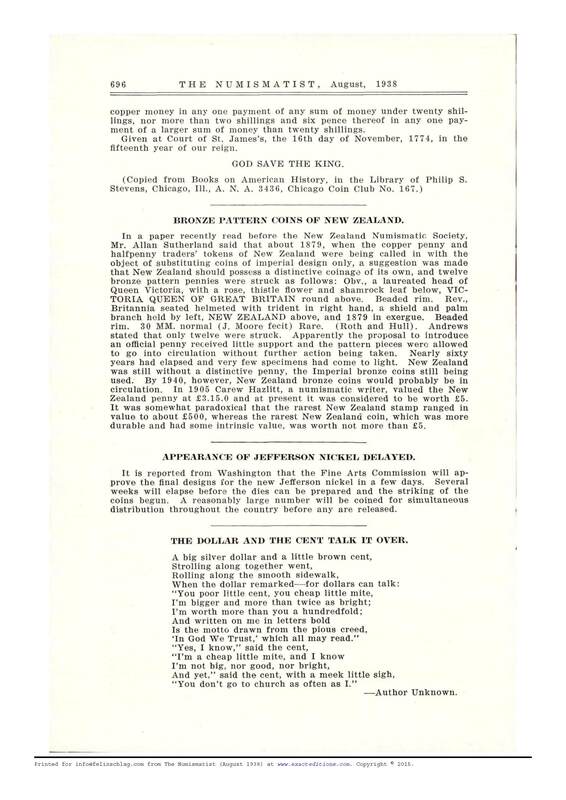 Catalog information at the National Archives, College Park confirms a total of 398 indexed entries from at least 337 unique artists and sculptors. 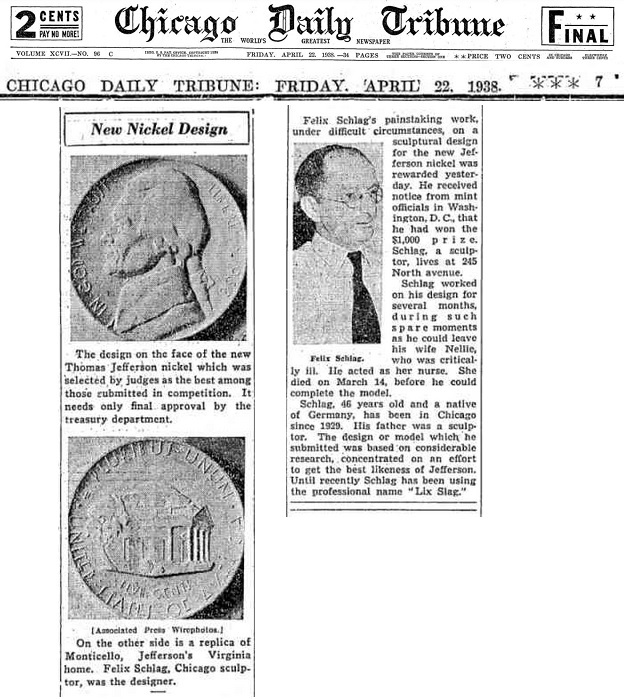 There were no less than 799 individual plasters depicting designs for obverses and reverses of the coin to review. The majority of the competitors submitted a single model pairing (front and back); however, fourteen artists sent in additional models (multiple obverses and reverses) for consideration as part of a single indexed submission. Of these fourteen, eleven turned in just one additional plaster, two submitted two extra models, and one artist chose to send eight supplementary plasters for review. 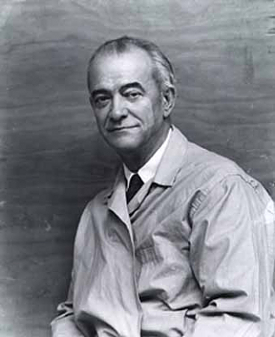 Four artists chose to submit just a single plaster and were no doubt immediately disqualified for not conforming to the contest instructions. 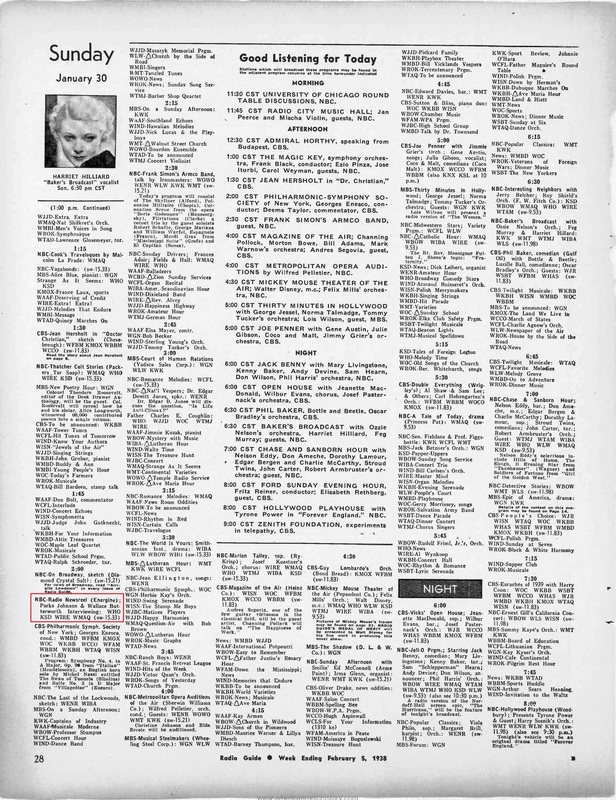 A complete list of artists who were identified in the archives catalog review is in the margin. Note: During the initial catalog review at the archives, six indexed entries were unaccounted for. A second trip is planned to review the entire catalog again in hopes of locating the missing six. 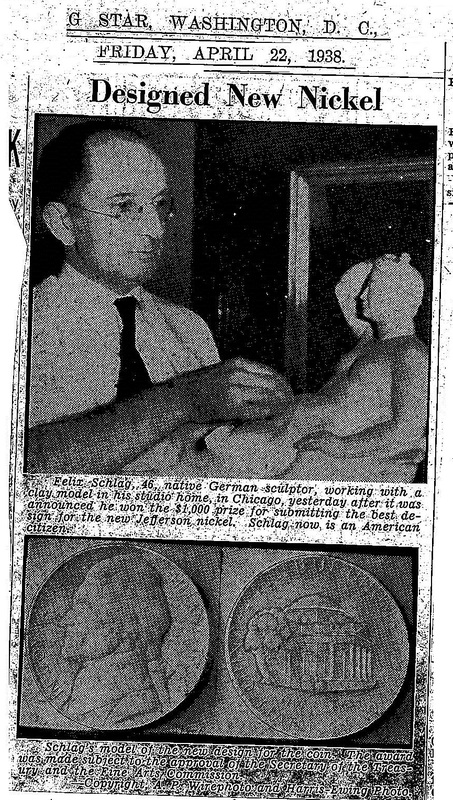 According to Schlag, and as reported in the January 1965 issue of the Numismatist, on April 20, 1938, five days after the models were submitted, he received a telegram from the Superintendent of the Section of Painting and Sculpture requesting he provide a biography. A day later he reportedly received a phone call advising him that he had won the contest. 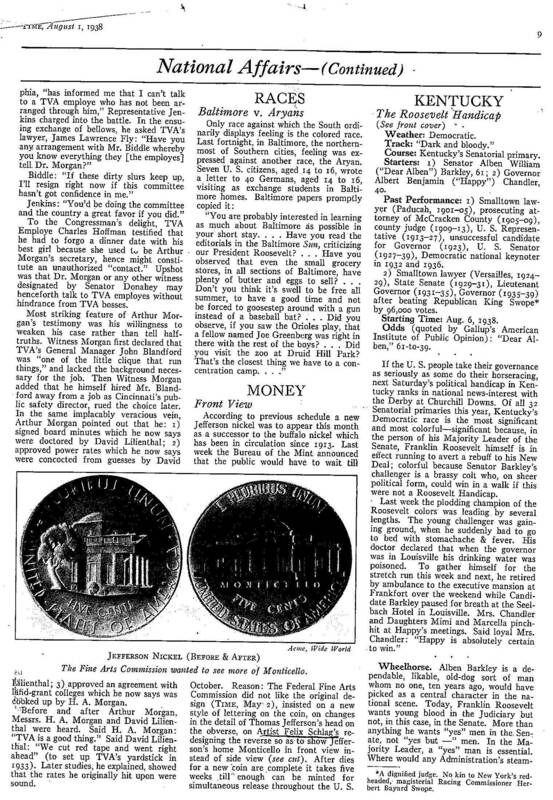 On April 21, 1938 the results of the contest were announced to a national audience via various news publications. 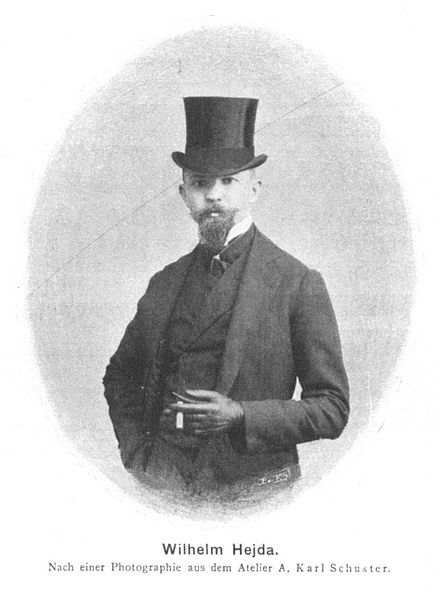 Felix, as the winner, was the only name mentioned in the press. 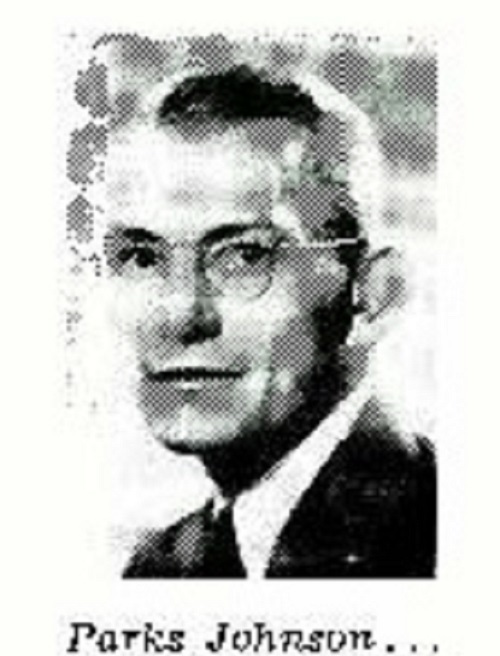 Henry Kreis received recognition as the second place finalist in TDAP Bulletin #17 and catalog information at the National Archives, College Park confirms that Wheeler Williams was judged to be the third place contestant. 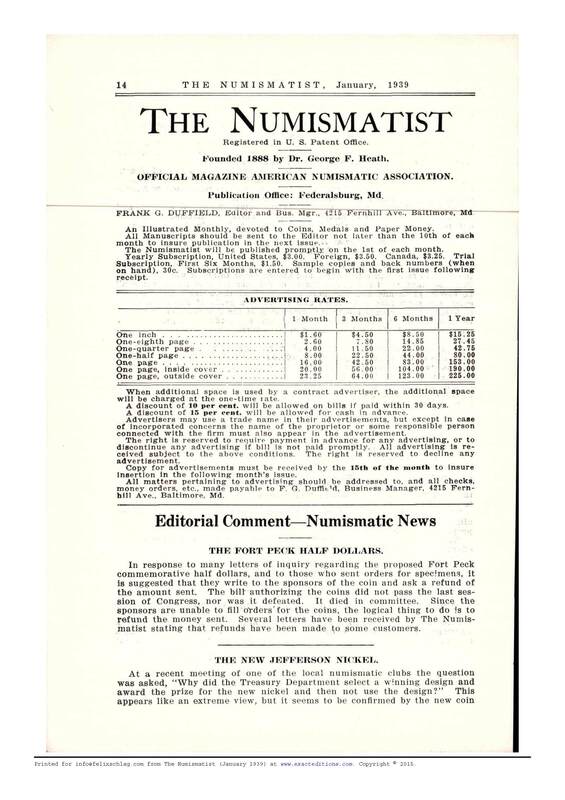 Interestingly enough, it was not until September 1938, when Bulletin #17 was issued by the TDAP, that the results of the contest were reported. 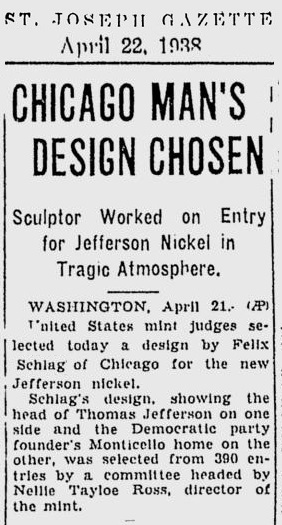 The cause for this delay could be that Schlag's final designs, including the revisions required by Treasury, were not formally approved until late July 1938. 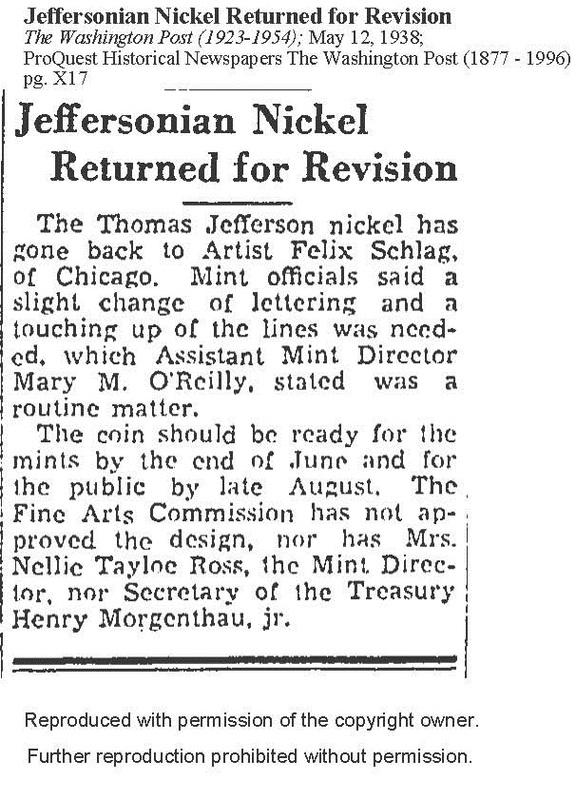 An Advisory Committee consisting of Mrs. Nellie Tayloe Ross, Director of the United States Mint, Heinz Warneke, Sidney Waugh, and Albert Stewart, sculptors, awarded to Felix Schlag of Chicago, the money ($1,000) offered by the United States Mint for the best design submitted in an anonymous competition for the Jefferson Nickel. The design submitted by Henry Kreis received Honorable Mention. 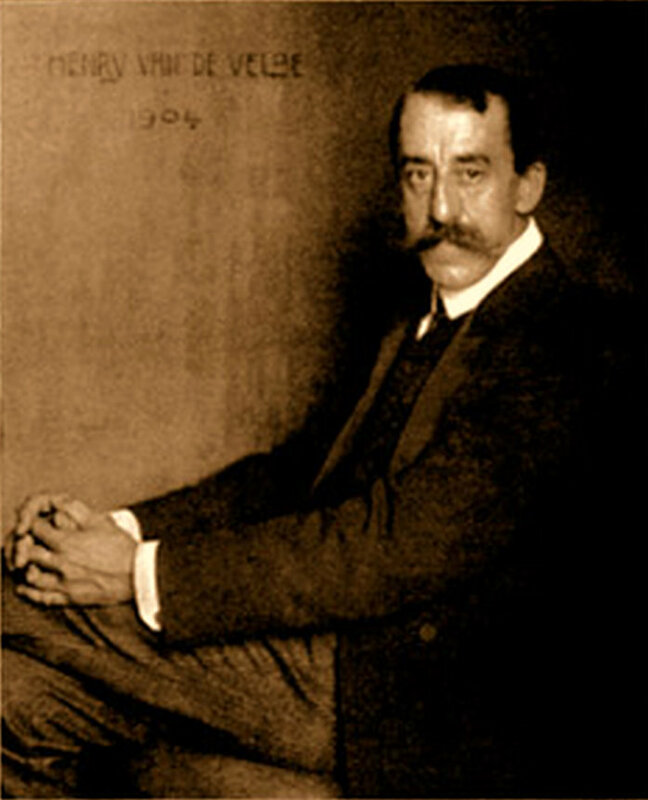 Mr. Schlag was born in Frankfurt, Germany, in September 1891. He has won many prizes and began his art studies in the Munich Academy in Germany.  An American citizen since 1929. Arpad Jakobb, Roy E. King, Henry Kreis, Marcello Rotundo, Henry Vander Velde, at least one unknown artist, and of course Felix Schlag's original submission. 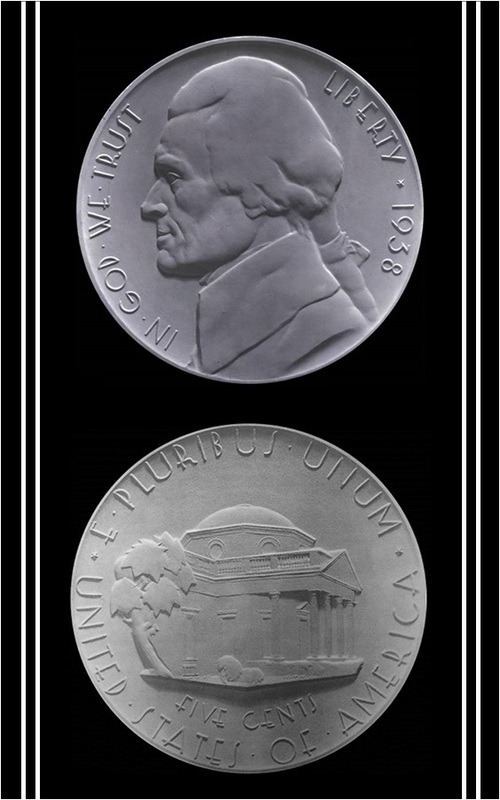 De Francisi submitted entries #190 A & B, #395 A & B, and #396 A & B. The Hejda brothers submitted entry #239 A & B. Note: This design is often mistakenly attributed to a Frans Karel Hejda. 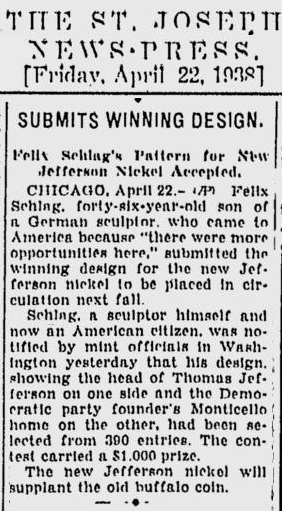 The records of the National Archives indicate that Wilhelm and Frank Hejda were the only contestants with the last name Hejda. Jakobb submitted entry #289 A & B. King submitted entry #191 A & B.
Kreis submitted entries #387 A & B and #388 A & B, receiving honorable mention for one of the pairs. Rotundo submitted entry #139 A & B. 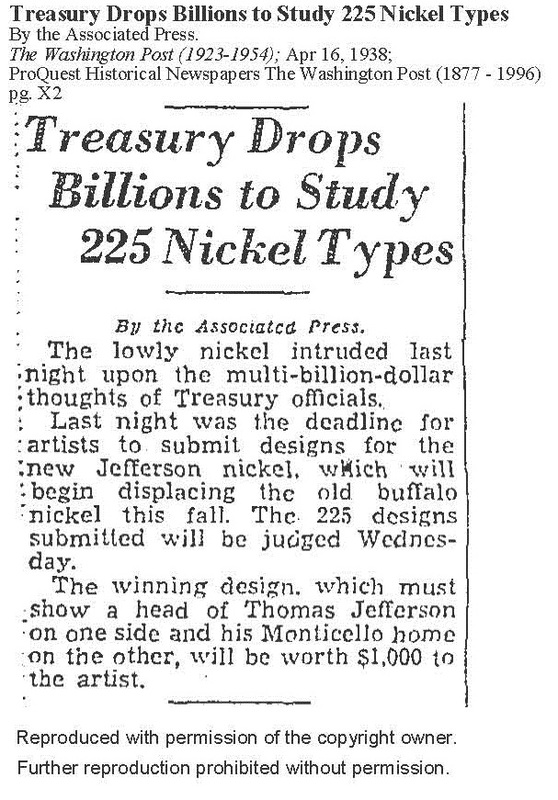 In August of 1938 he exchanged several letters with the Commission of Fine Arts, seemingly complaining that the final design of the nickel very nearly reflected his original submission. Schlag submitted entry #340 A & B; the ultimate winning pair of the contest. Vander Velde submitted entry #205 A & B.
Williams submitted entries #242 A & B, #243 A & B, and #244 A & B, receiving the third prize for one of the pairings.